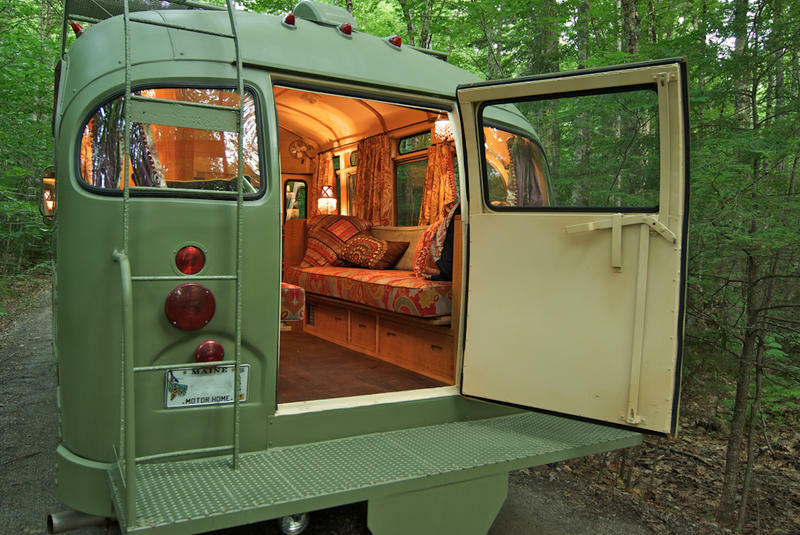 Life on the road is a great way to explore the world in comforts reminiscent of a home. There are numerous examples of mobile homes built by people having a strong wanderlust or the ones wanting to minimize their lifestyle. 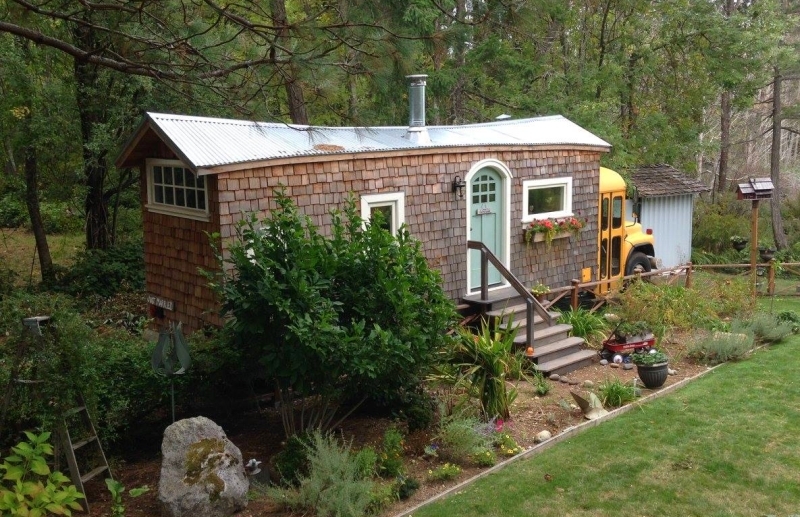 In addition to the tiny house on wheels, there’s a new trend of school bus conversion catching up. 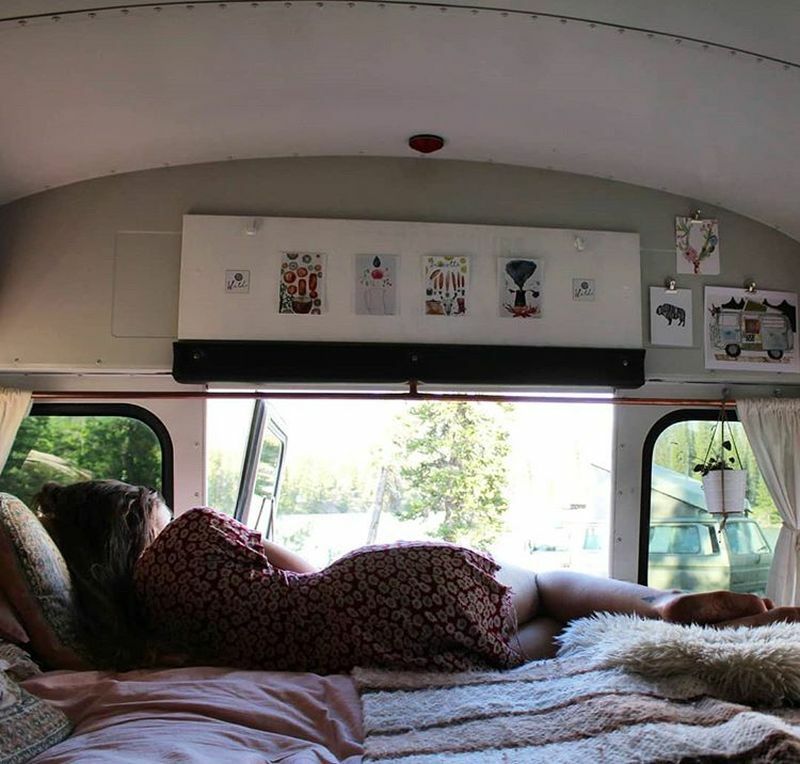 It is all about turning old school buses into a cozy mobile home. 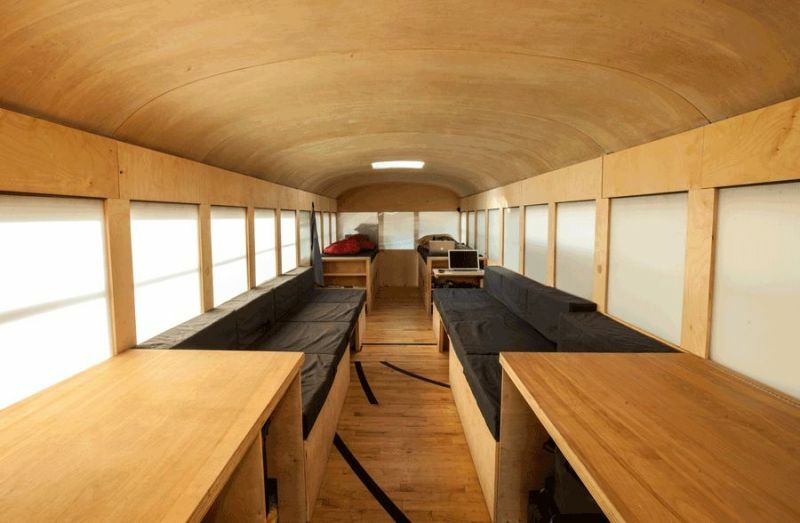 Mostly, these renovated school bus homes are built from scratch by people on their own or with the help of some professionals. 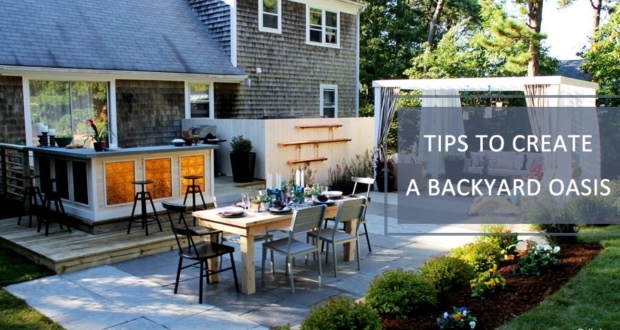 Those who want to cut overall construction cost and want everything tailored to their needs never hesitate from going for a DIY. 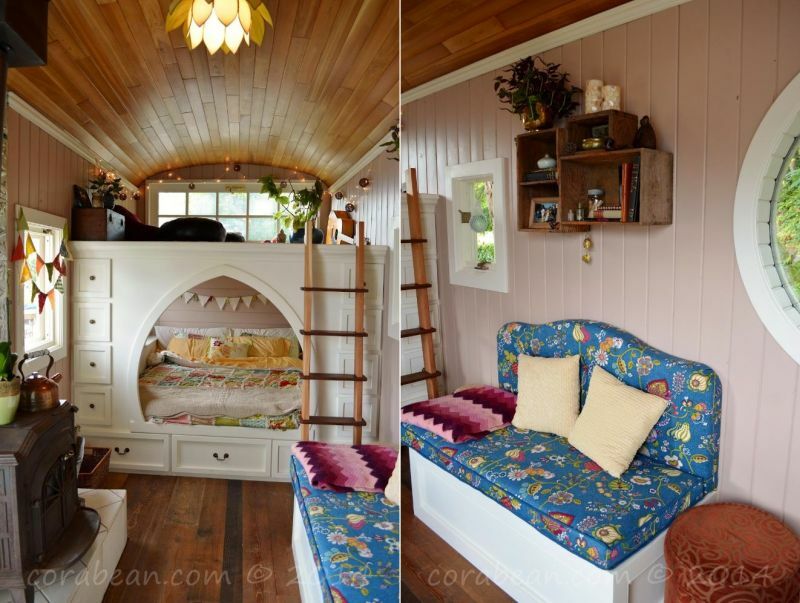 You may find several examples of couples refurbishing old skoolie, short buses into tiny-traveling homes. 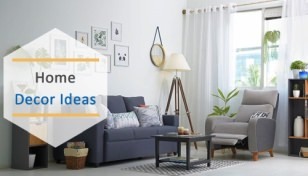 From furniture and appliances to storage, all the features are housed as per a floor plan. 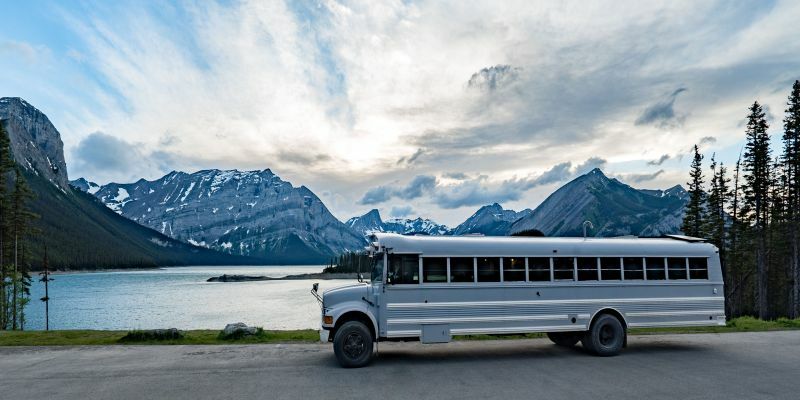 If you’re planning to buy a school bus home or convert one by yourself, here are some of the best school bus conversions you can get some inspiration from to embark on the adventure trip of a lifetime. 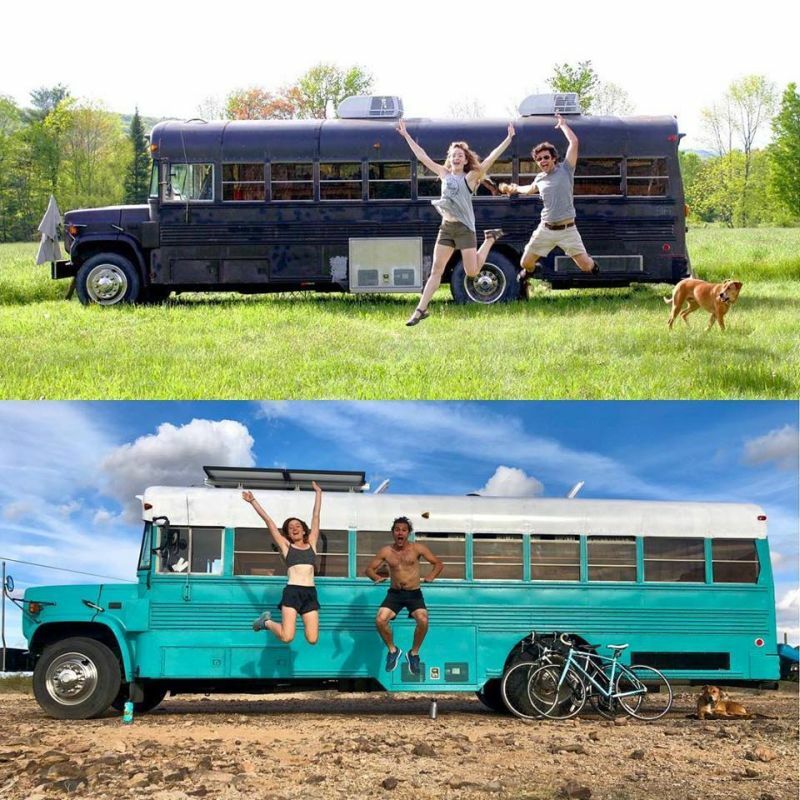 Will Hitchcock and Alyssa Pelletier of Outside Found started refurbishing an old school bus into a luxury tiny home on wheels in October 2014 and completed the project by March 2015 in mere six months of time. 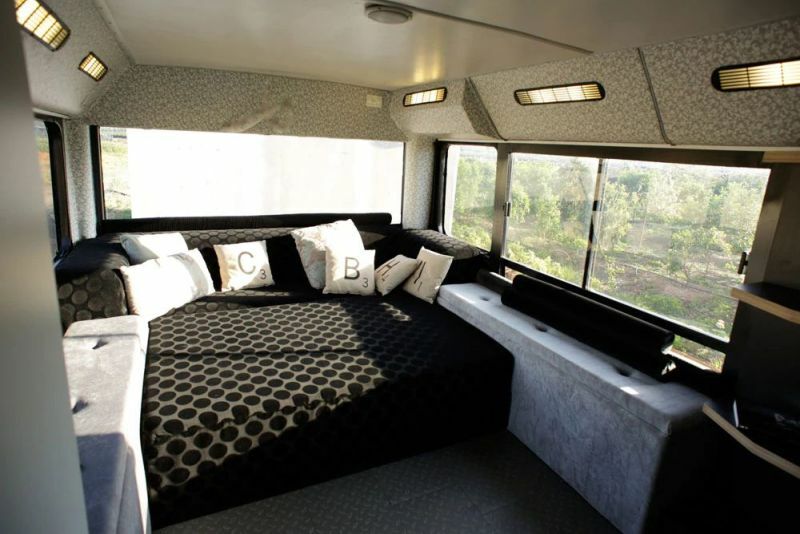 The living room, right behind the driver’s area has a comfy couch with integrated storage and a large drop-down table. 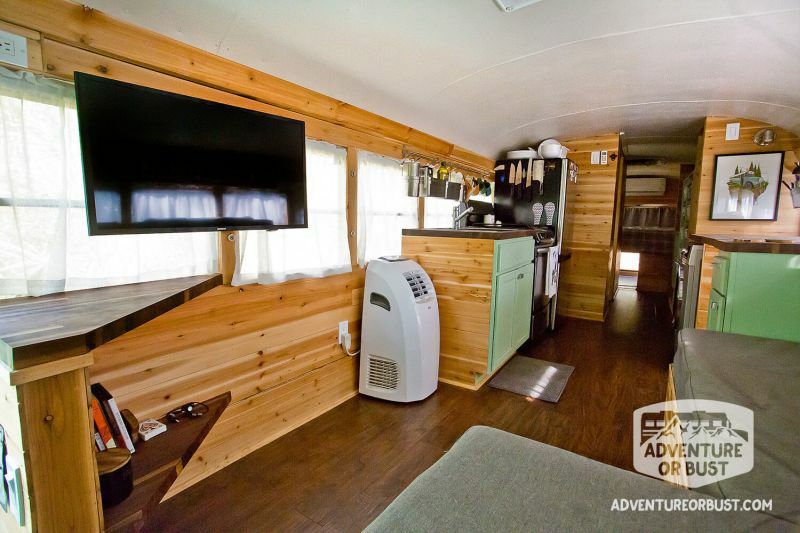 There’s a full-size kitchen with an electric/propane Norcold RV fridge, two burner Atwood propane stoves, and a six-gallon Suburban propane water heater. The office area is situated alongside the kitchen and has two seats for a mobile home office. As of the bedroom, it appears to be a cozy space with wood-paneled walls and a skylight. 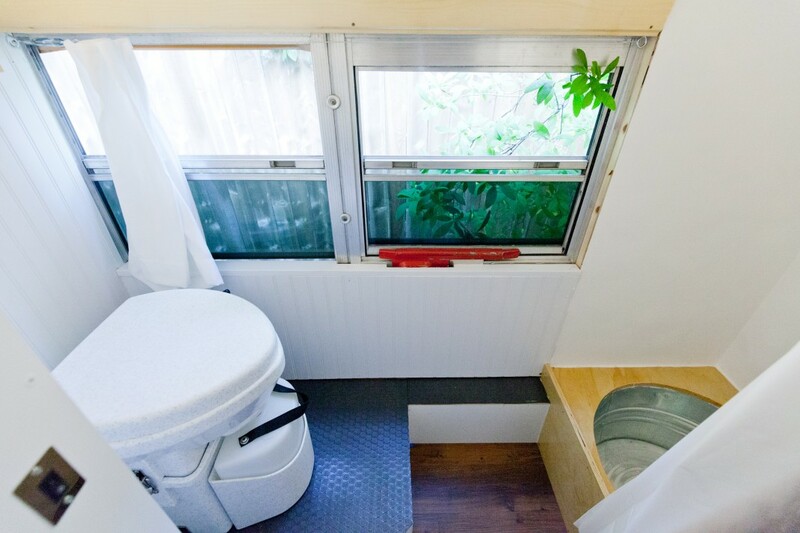 The bathroom includes a composting toilet and a tiny shower. There is storage for camping gear at the back of the bus. 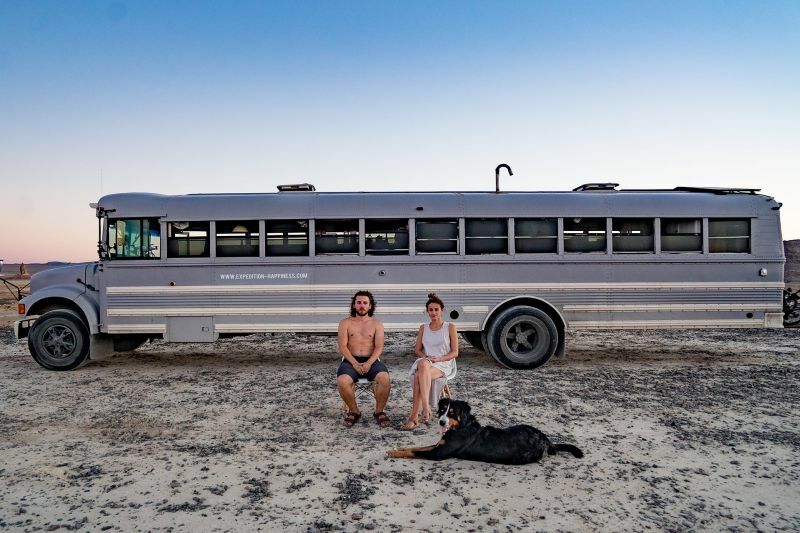 After getting inspired by a school bus conversion, the German couple Selima Taibi and Felix Starck decided to make one for themselves. 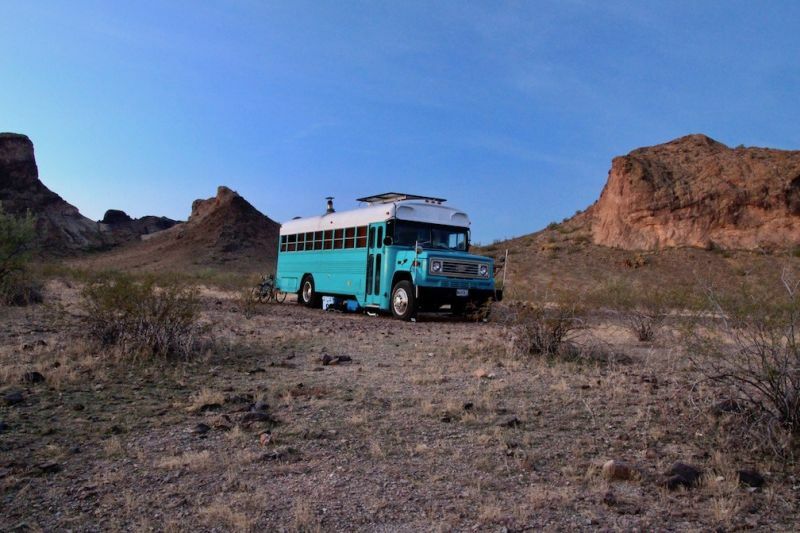 Under the name Expedition Happiness, they started an epic road trip with their dog, traveling across North America in this bus home. 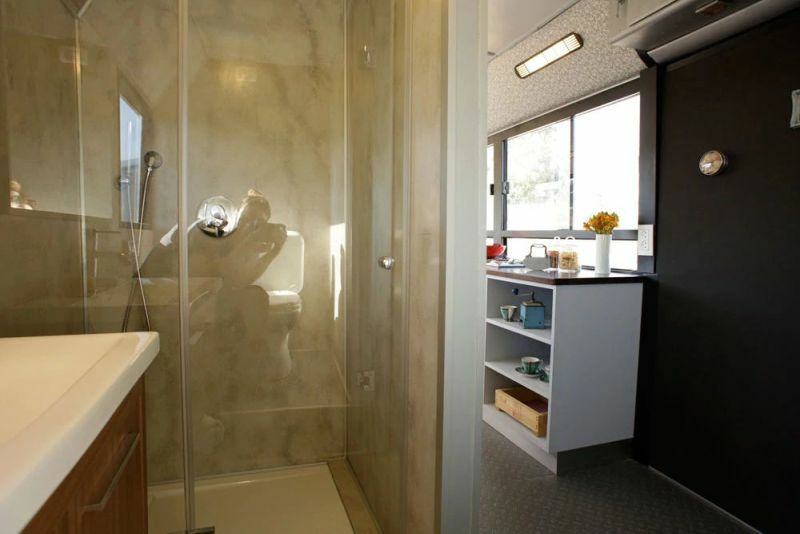 They bought the bus from Thomas International School and got down to remodeling interiors to accommodate a living room, bedroom, kitchen and bathroom with a composting toilet and classy shower. 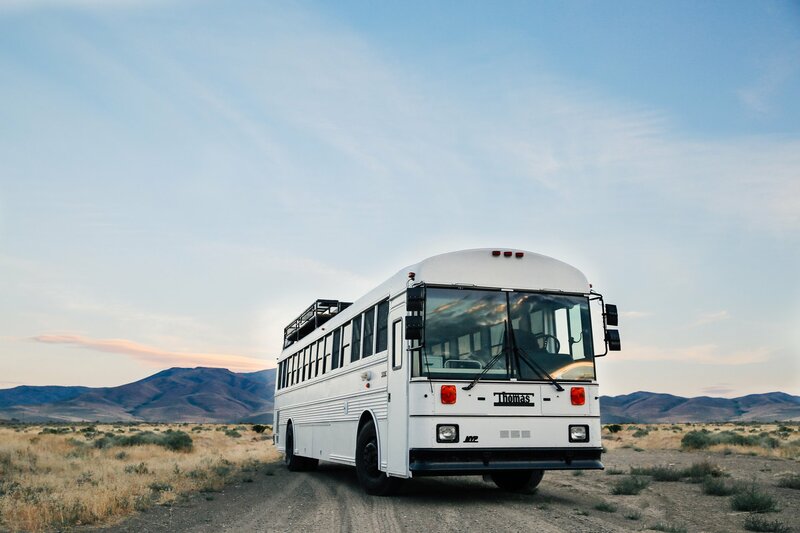 Since this bus has a number of windows, it allows them to capture mesmerizing landscapes and wilderness on the road. 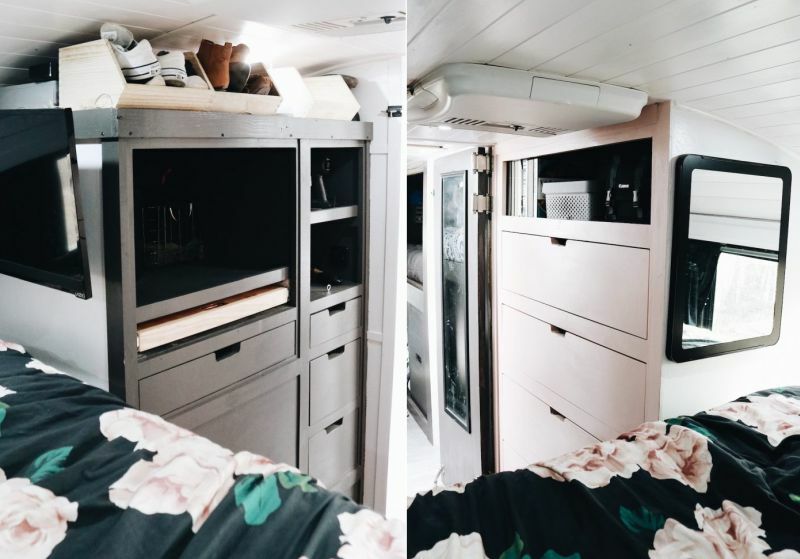 This bus home built by Katy, a blogger at Busonomics, and her husband, is the perfect solution for their need for affordable housing. 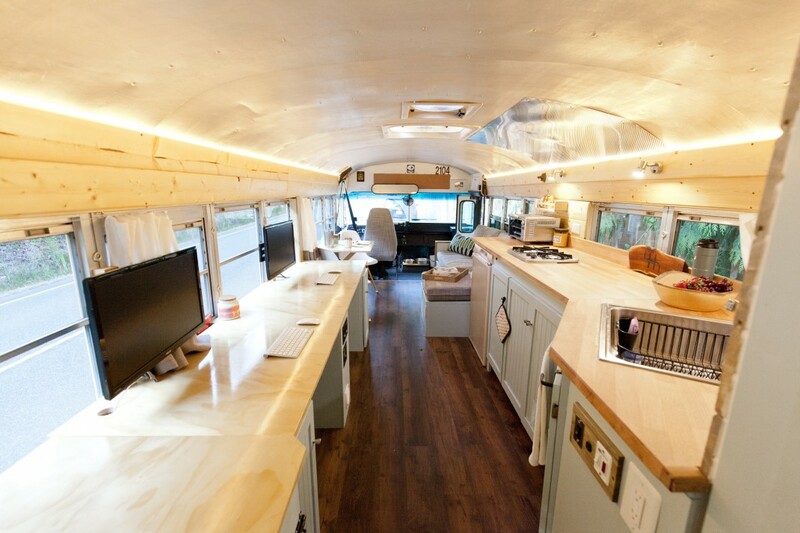 They ended up refurbishing an old school bus into a home for two, with 200 square feet of living space. 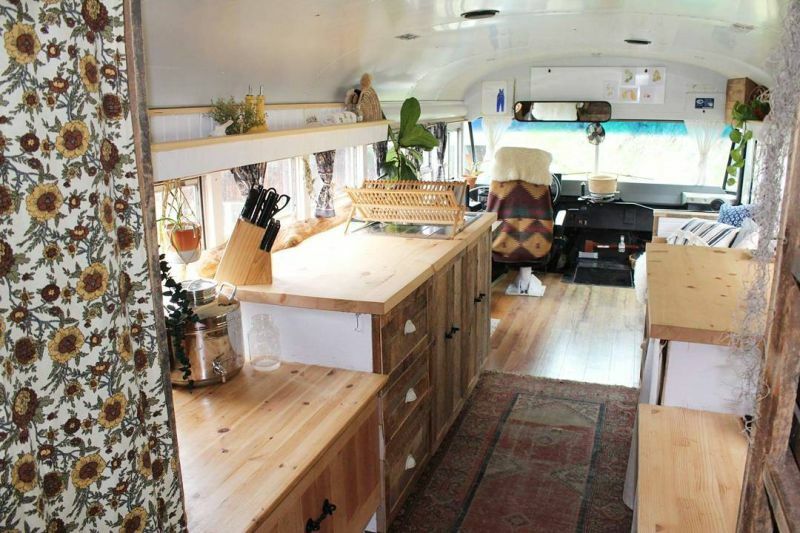 The Busonomics bus home includes a living room, dining room, kitchen and a lot of storage. 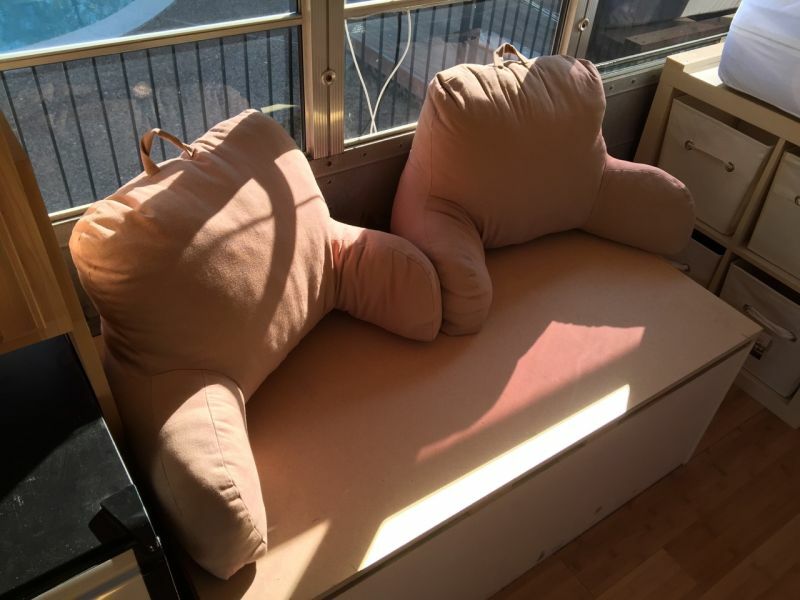 The wooden sofa in the living room doubles as a comfy bed for two when unfolded. The kitchen is equipped with modern cookware and appliances, and a small dining table in front of windows. 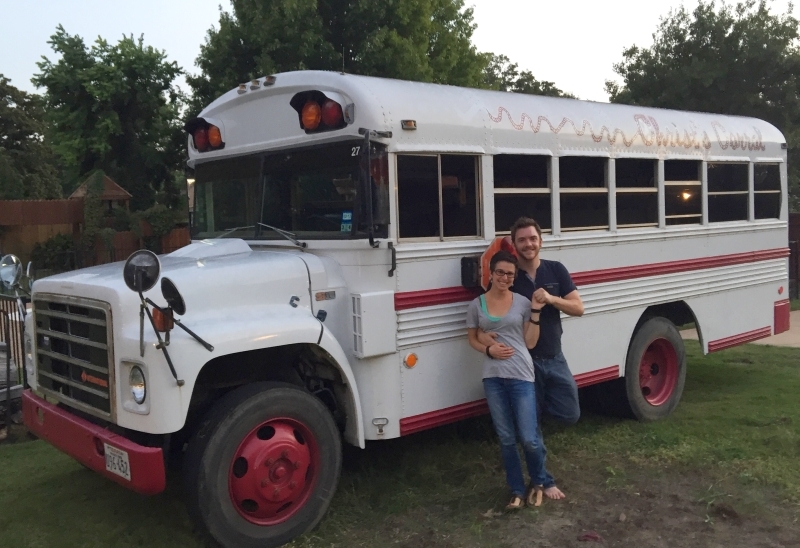 This school bus conversion by Brittany and Steven Altmann of Adventure or Bust is an attempt to bypass the high cost of living in Florida. 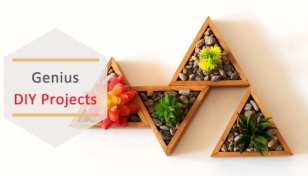 From the walls and flooring to furniture, there is a massive use of wood inside. There’s a total of three doors, including a side door. As they wanted a more sustainable life, they installed solar panels, composting toilet, freshwater and grey water storage. The bus home is insulated with closed cell spray foam and roof with silicone roof coating to reflect the heat of the sun. They began building the bus home in March 2016 and completed in March 2017, after spending about $18,000. 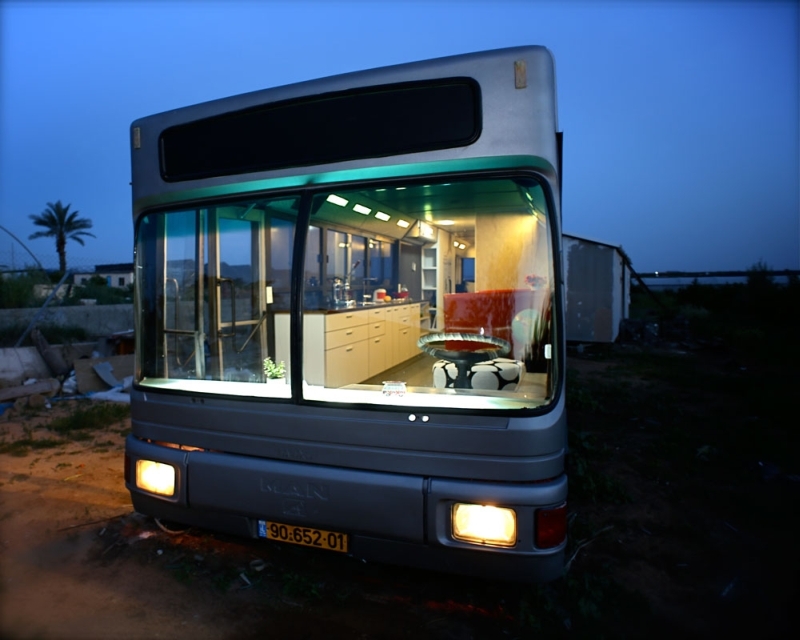 Housing is a big problem in Israel, and seeing it as an opportunity to get creative, two women – Tali Shaul and Hagit Moravsky – decided to go for a bus conversion with the help of a designer friend named Vered Sofer Drori. As the rear of the bus was higher than the front, balancing the slope was one of the biggest challenges resolved with carpentry work. As windows are left intact, the interior space welcomes lots of natural light. One side across the windows is meant for bright orange diner benches while there are kitchen cabinets on the other side. 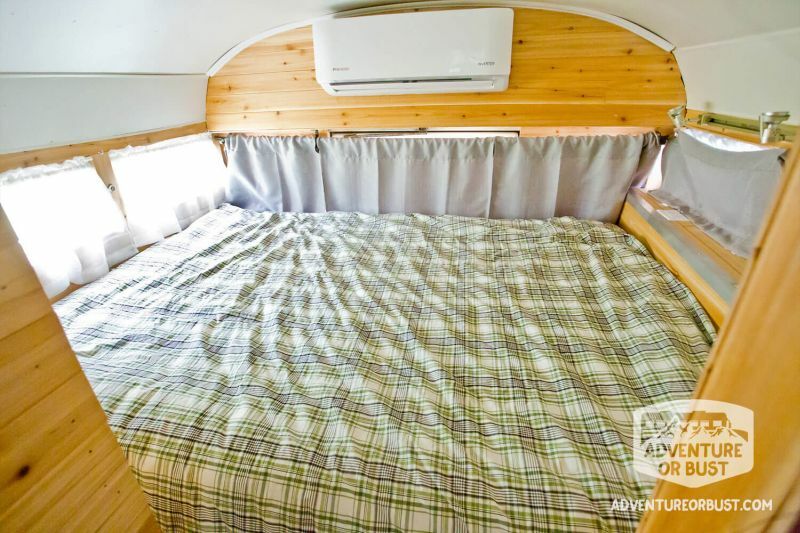 In addition, the rear seat is refurbished as a double bed. There’s a bathroom with shower, a bathroom cabinet and toilet. 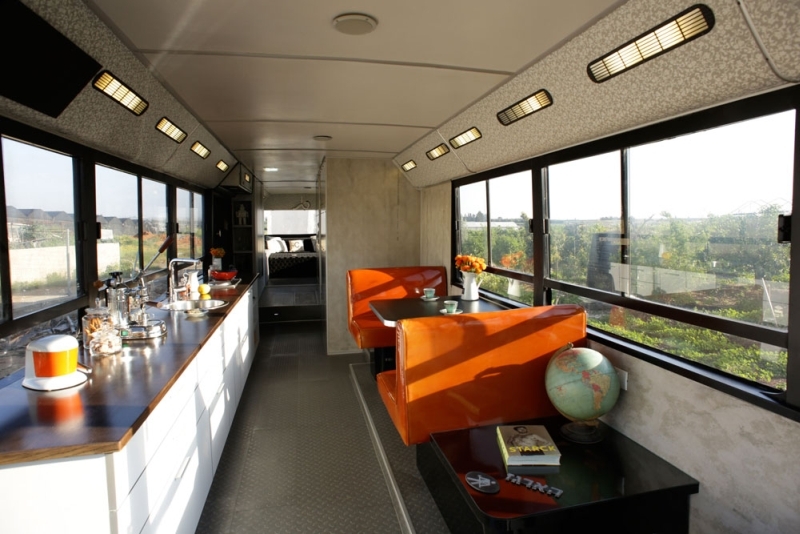 This cool home on wheels is more of a design inspiration for those who like being on the road. 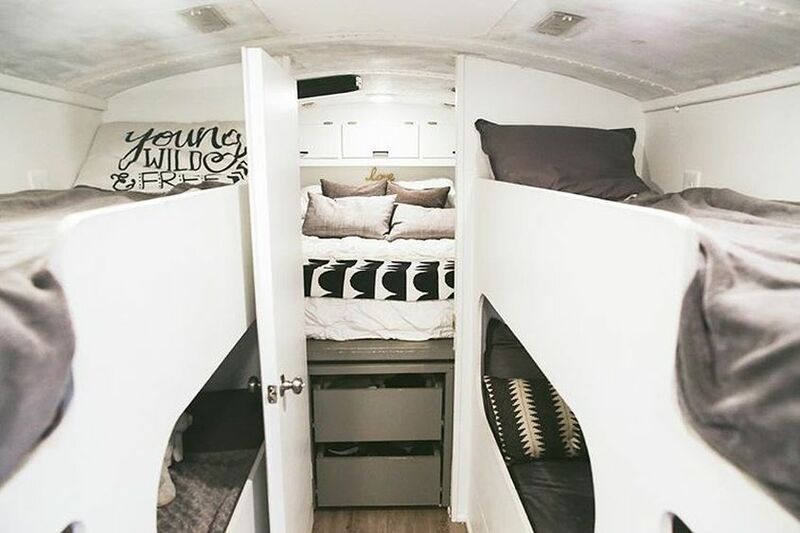 Created by the architecture student Hank Butitta, this bus home offers 225-square-feet of living area, including kitchen, living room and bedroom. 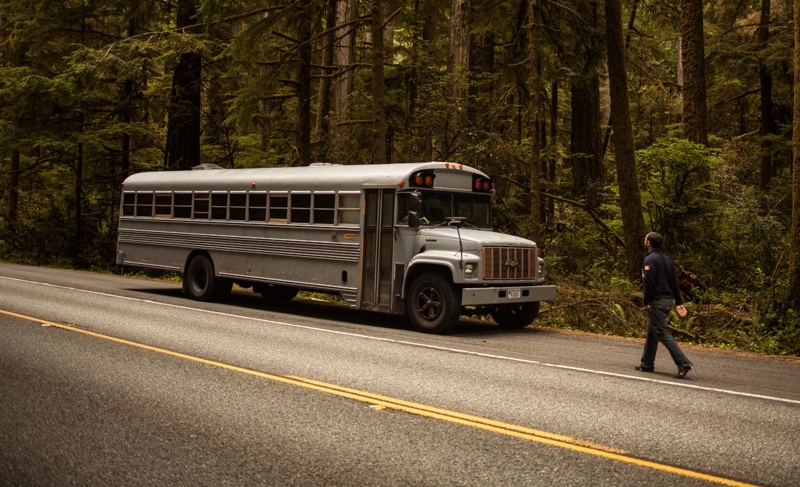 He bought the school bus for $3,000 and invested another $6,000 to complete the project in 15 weeks. 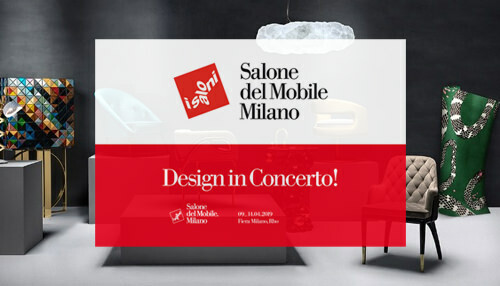 It consists of four modular units of 28 square inches, grouped to create four primary zones: bathroom, kitchen, seating, and bedroom. 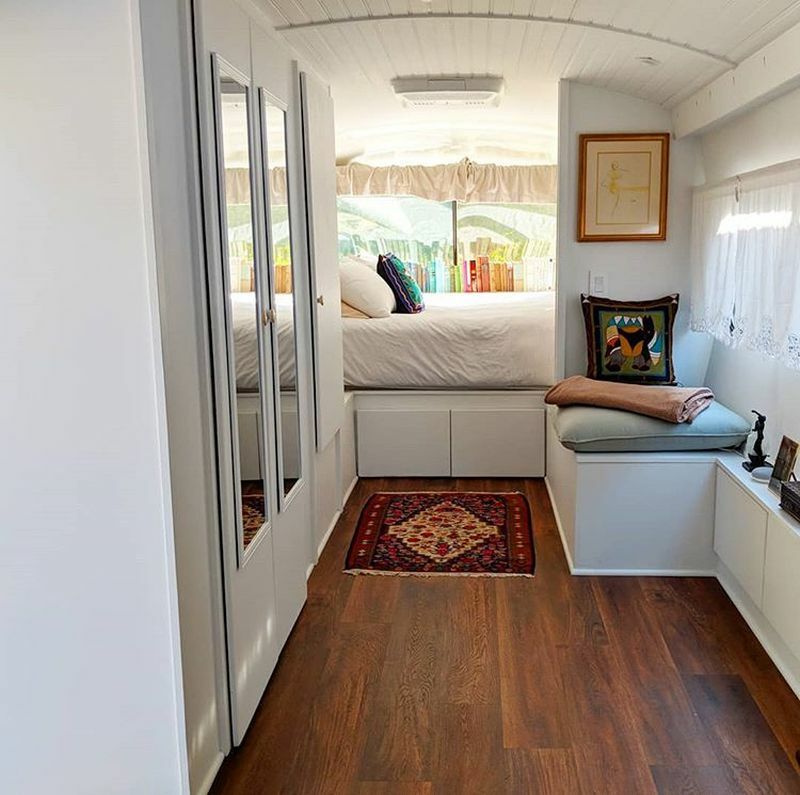 In addition, there is a hidden storage compartment, LED lights and wooden flooring to make one feel at home. 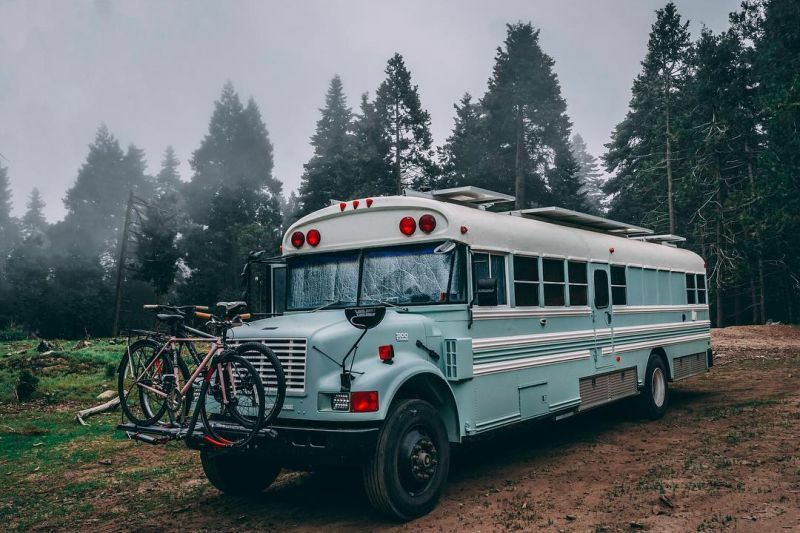 This 1996 Bluebird school bus turned into a full-time residence in Charlemont, Massachusetts is a great source of inspiration for tiny home lovers. The wooden-styled interiors distinguish it from other bus homes. Inside, there’s a full kitchen, dinette, fold-out bench, bedroom with storage space, and bathroom with composting toilet. 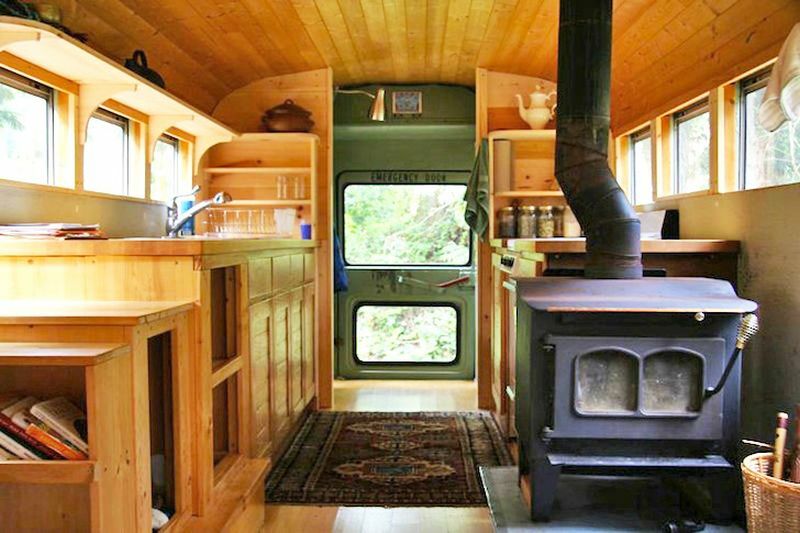 This school bus home by wpi Creative features a wood-fired stove to give you a feel of being in the woods. 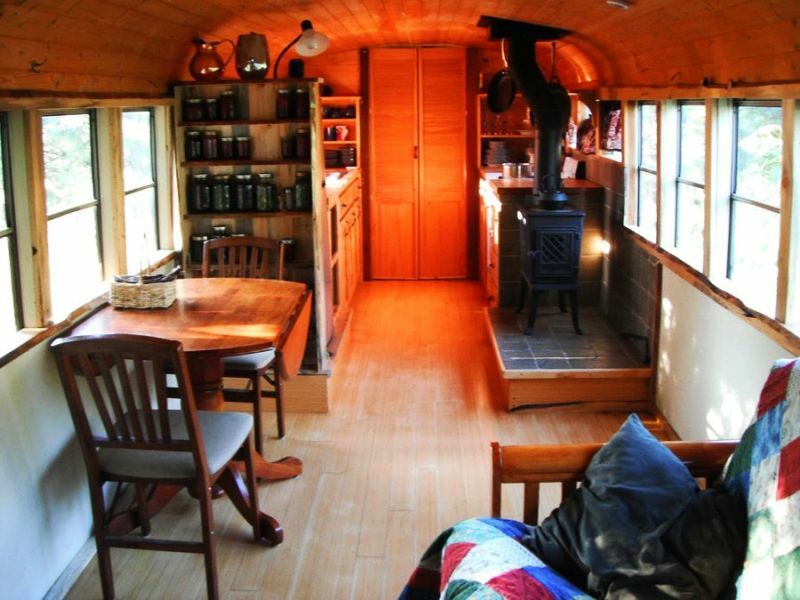 The bus home has a kitchen, living room, bedroom and a lot of storage space. 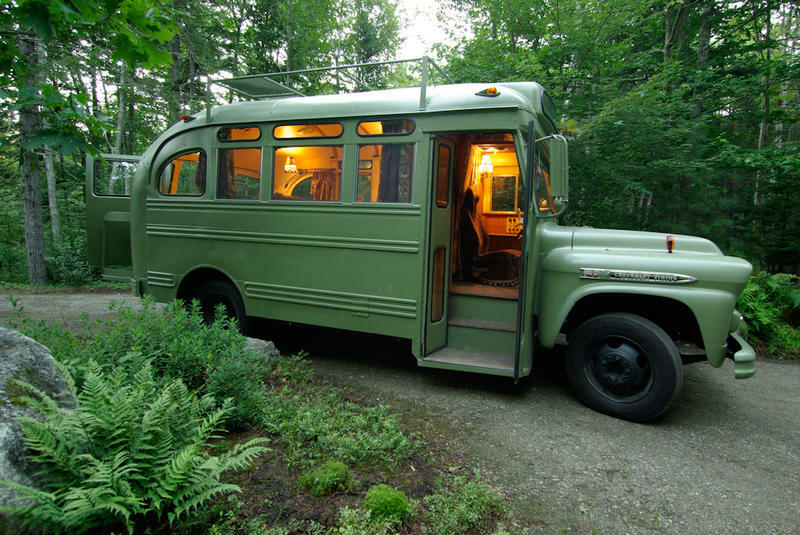 It was later sold to a young couple in the Cascade Mountains. 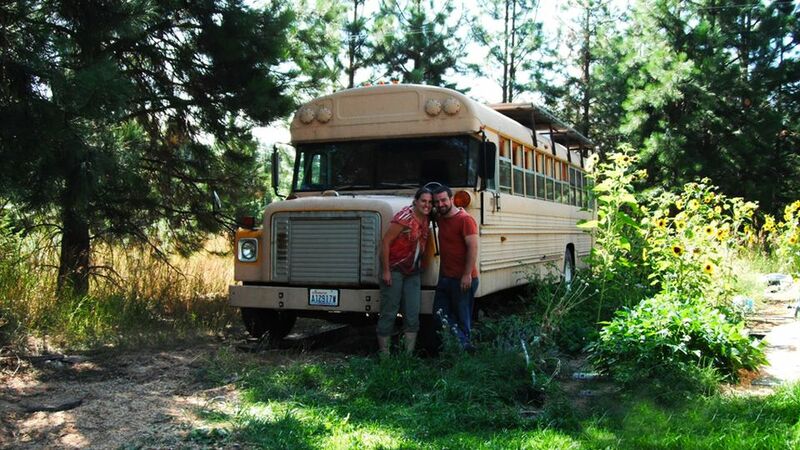 In order to get some happy family time, the US-based couple Gabriel and Debbie Mayes opted for a school bus conversion. 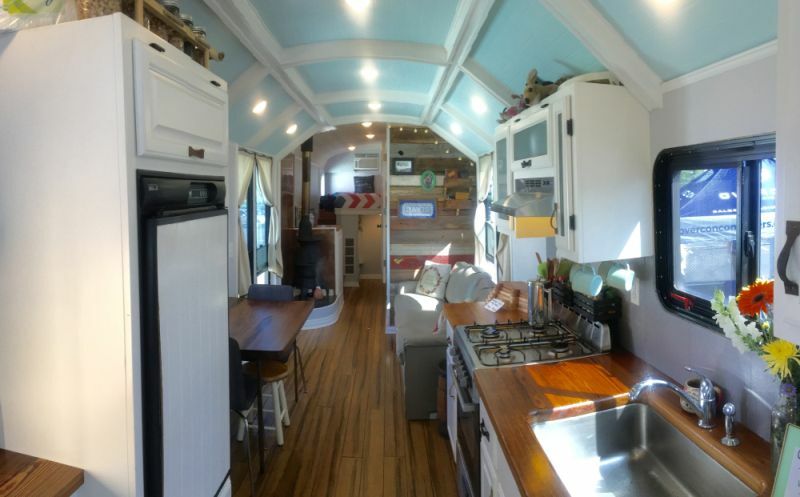 They have transformed a 2000 Thomas High Top school bus into a cozy mobile home, with a roof deck, full kitchen and sleeping space for up to eight. The floor plan is interesting – the kitchen and living area share the same room while kids’ room and master bedroom are concealed behind doors. The complete white color scheme fills a modernist flair to interiors. In the kitchen, there are a lot of overhead shelves and a drop down dining/work table. Small interior design ideas like installing shoe storage near door make it easy to keep the mobile home clean. 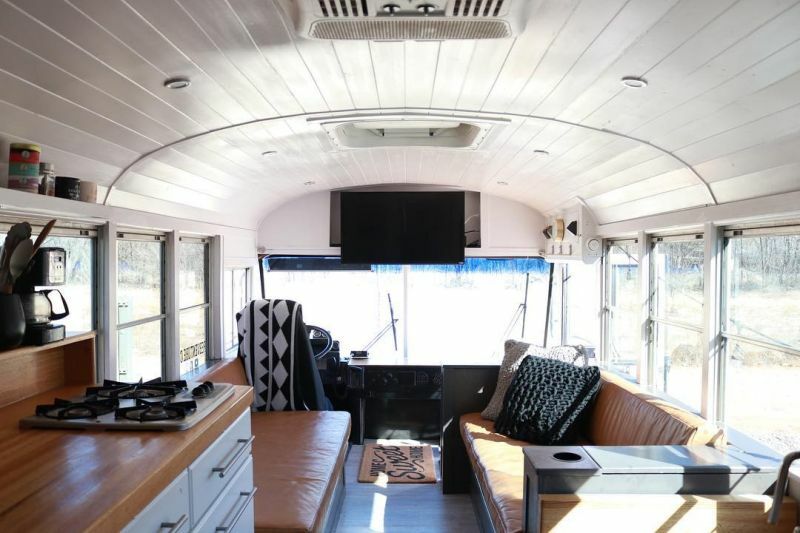 Some other notable features of this converted school bus home are 250-square-feet of living space, floor to ceiling height of 6′ 5″, and two sofas that convert into a queen-sized bed. 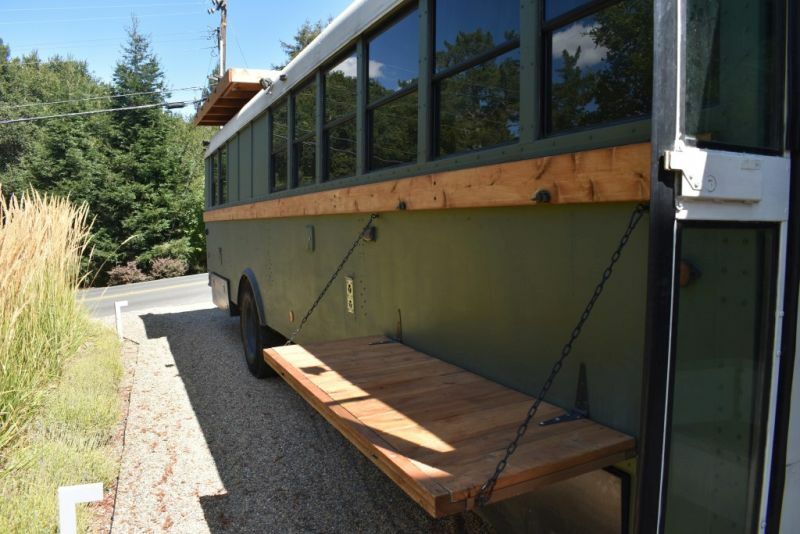 Renovated by Tessa and Jacob for just $9,244, this bus home is largely built using reclaimed materials to lower the cost. 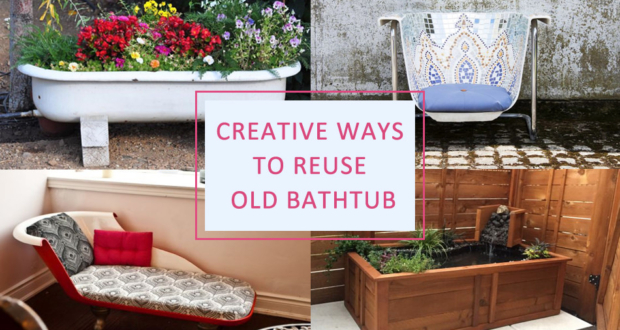 There is massive use of repurposed wood for cabinets, table and other furniture. 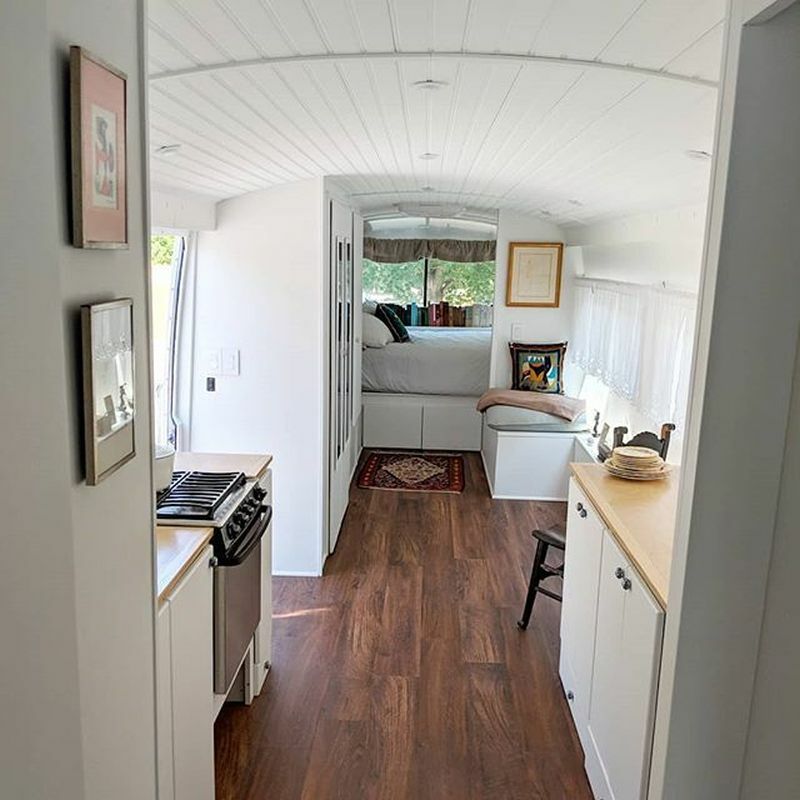 It features a cozy sitting area that doubles as a guest bed, a full kitchen with plenty of counter space and dining area, and a double bed at the back. The space covered up by all the wheel wells is utilized for storage. 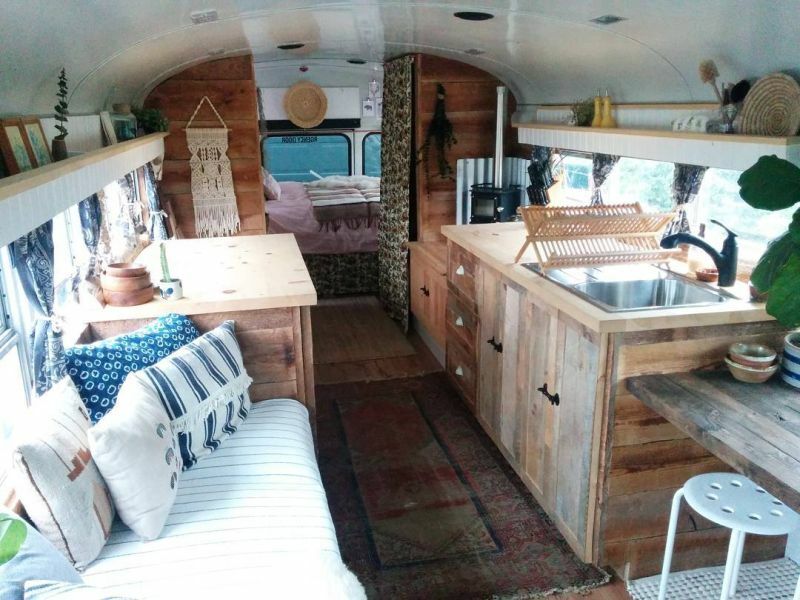 This converted bus home is an amazing DIY project by Luke and Rachel Davis. 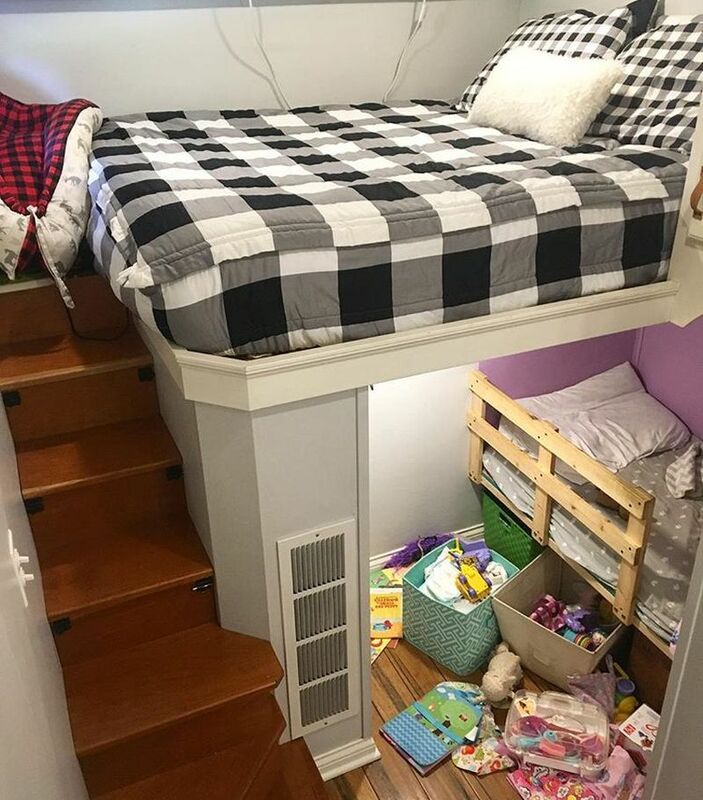 The most appealing thing is the raised roof that creates a loft bedroom with storage underneath. 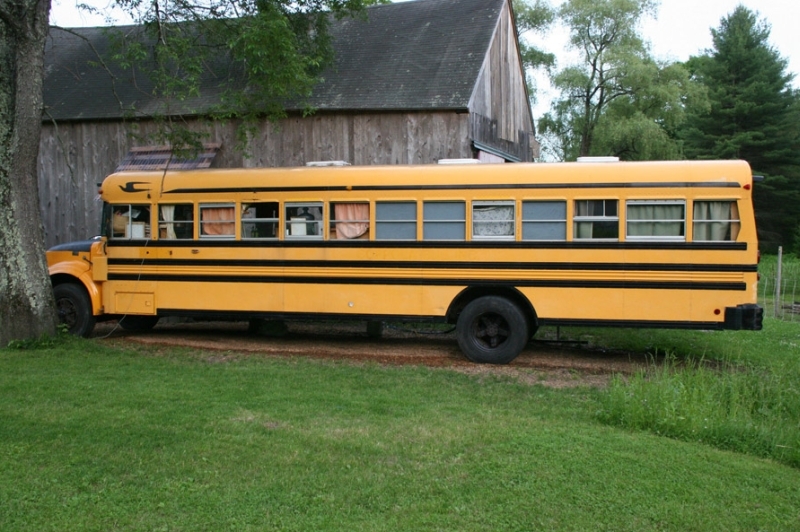 On the inside, you’ll find no clue that it is a school bus. 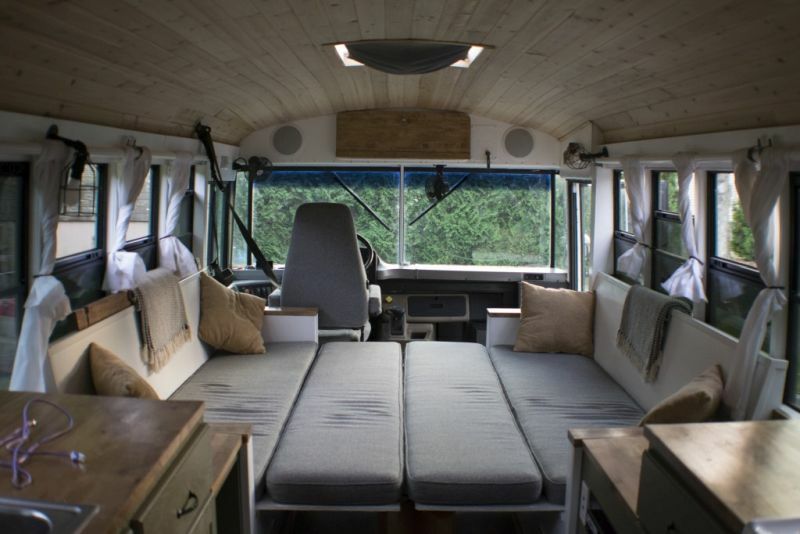 The bus home has a living room with convertible couch, kitchen, bathroom, two bedrooms and separate sleeping space for their little daughter. 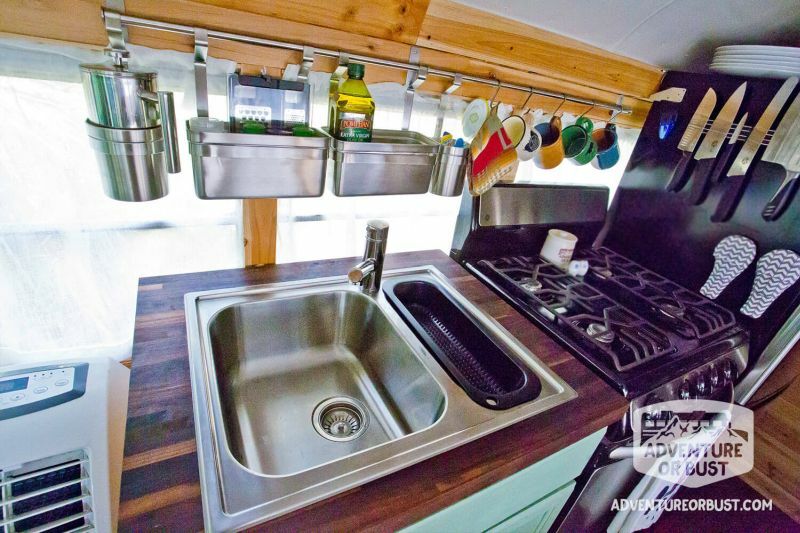 In addition, there are solar panels, water storage, RV style windows and retractable awning to fully enjoy the life on the go. 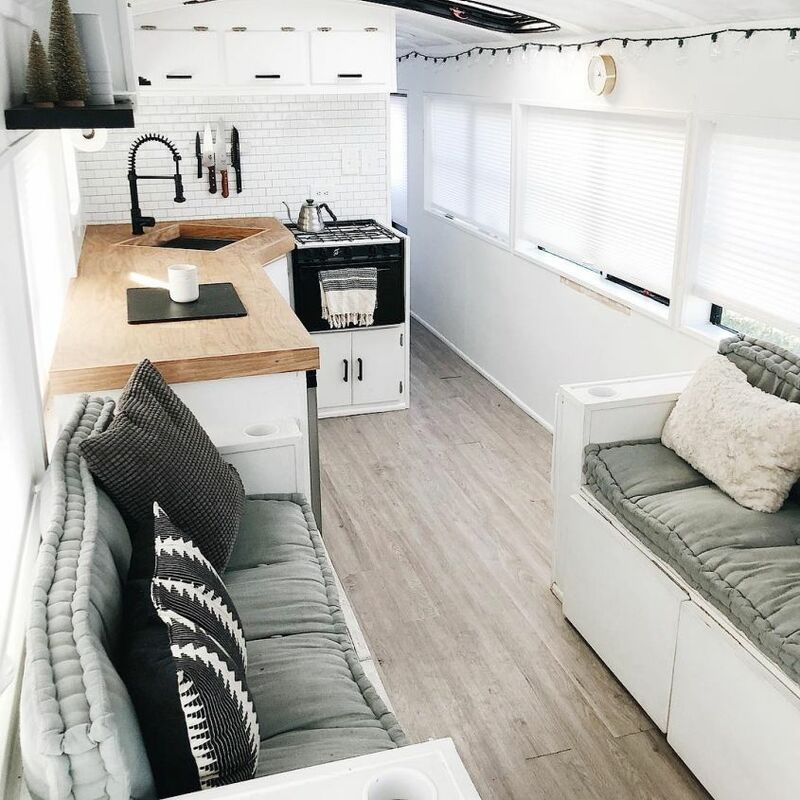 Debt-free living was one of the main reasons why Meagan and Ben Poirier of The Wild Drive Life converted a 1989 Chevy prison bus into a cozy tiny home. 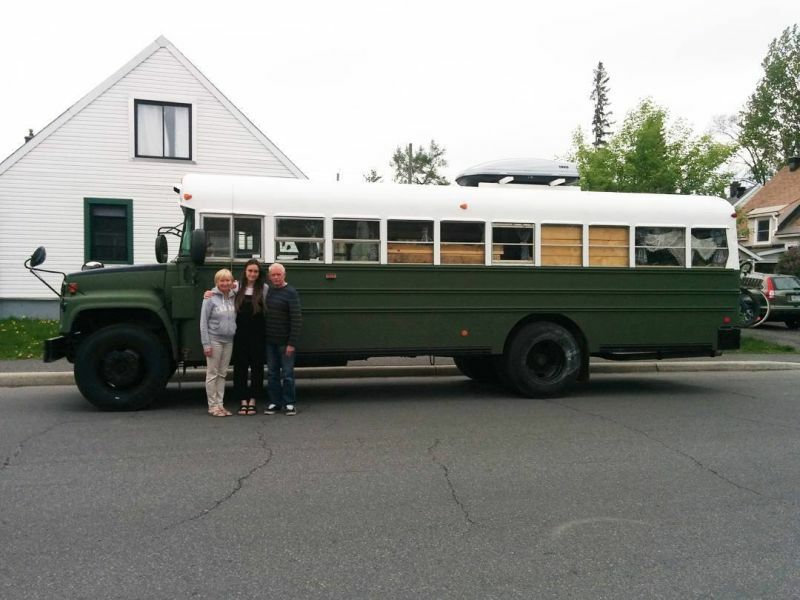 They spent about $23,560 on the bus conversion. For all-season efficiency, they used XPS rigid insulation and filled the gaps with spray foam. Inside, the open-concept floor plan keeps every space within the eyesight. 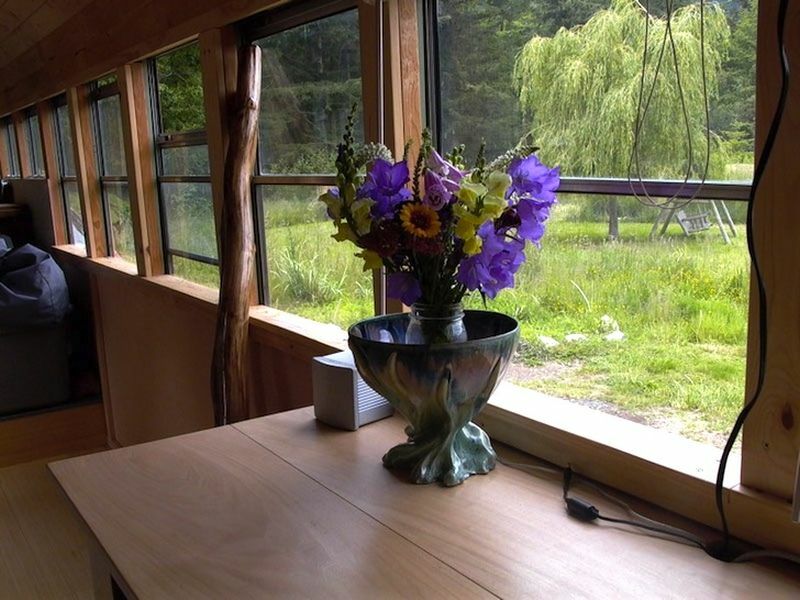 The lounge and raised bed with storage are conceived alongside a wood stove. 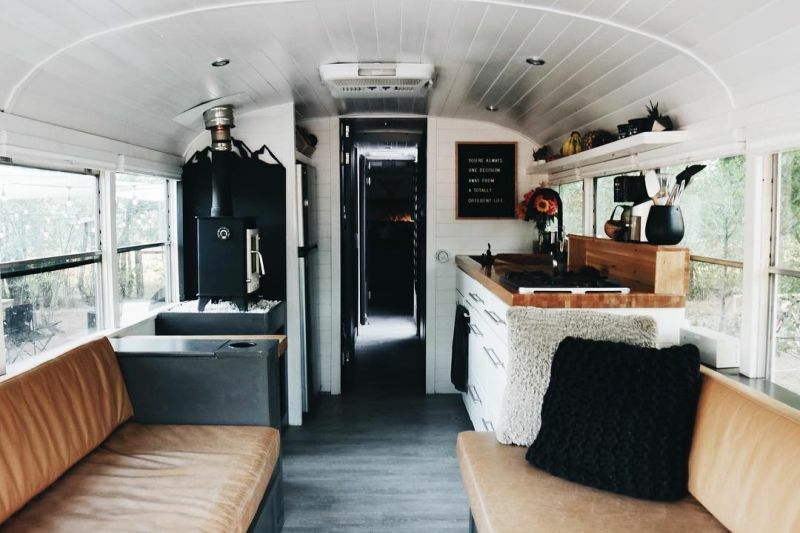 Jessie Lipskin spent three years and about $125,000 transforming a vintage Greyhound bus into a stylish mobile home, which she calls The Bus Tiny Home. 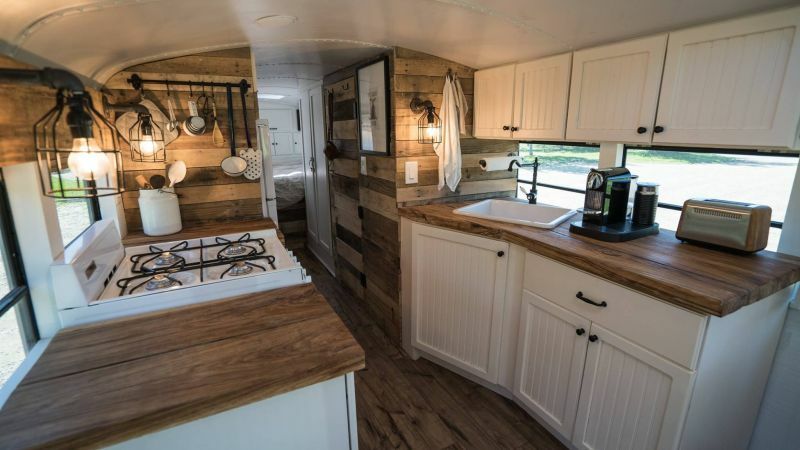 This 400-square-feet tiny house on wheels has a full-blown kitchen, bath, and two sleeping areas for up to four persons. 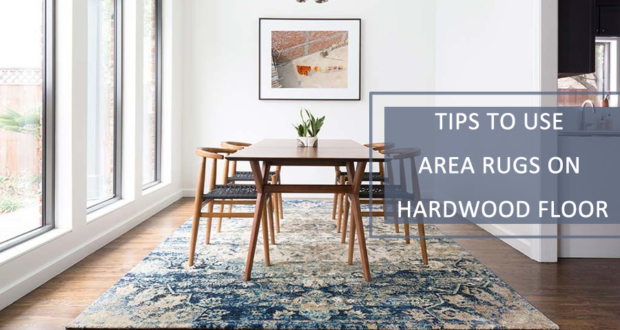 The hardwood flooring and Scandinavian style interiors add a sophisticated and minimalist touch. The large closet space with mirrored double doors makes space feel bigger. 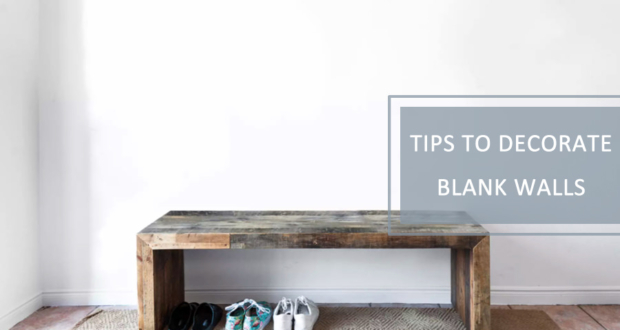 Another great feature is the DIY maple countertop in the kitchen. 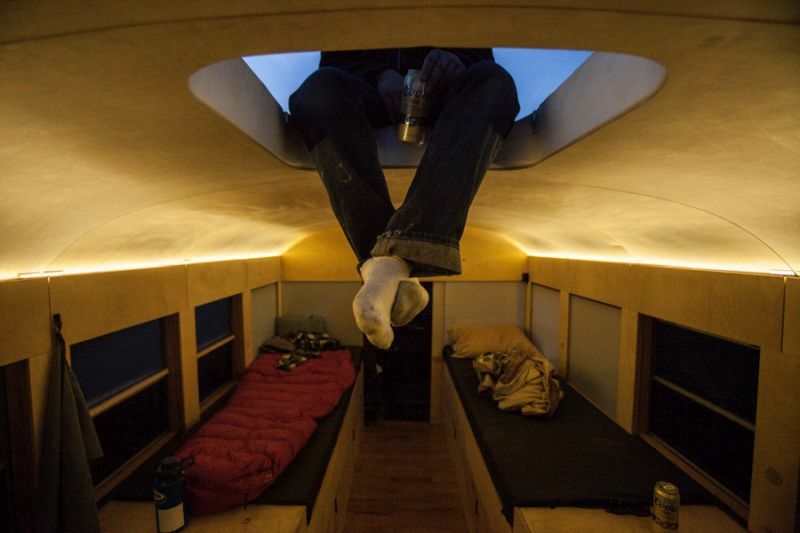 Michael Fuehrer from Stockholm, New Jersey, spent about $35,000 and nine months transforming a 2004 Thomas Freightliner school bus into a comfortable house with rooftop deck. 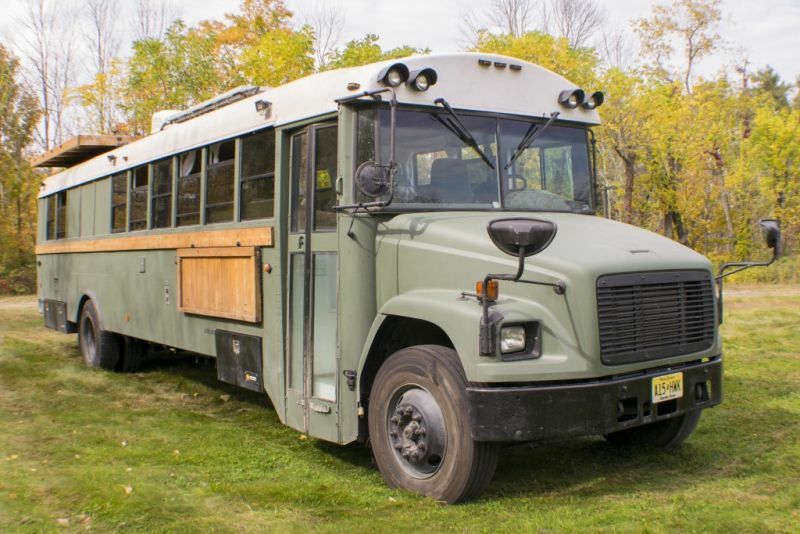 The army green exterior of the bus is outfitted with a retractable cooking area, storage, floodlights, rooftop deck and a garage at back. The fresh and grey water tanks are housed on the underside of the bus. 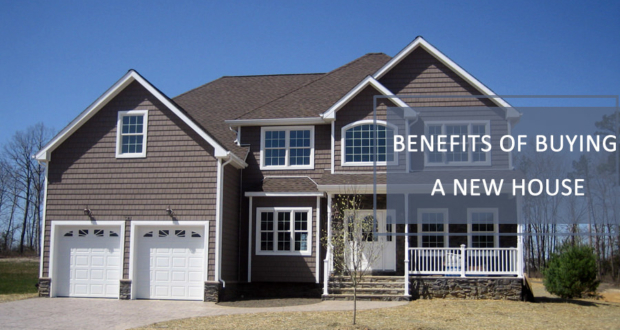 There are more modern features like skylights, solar panels, and an air conditioner. 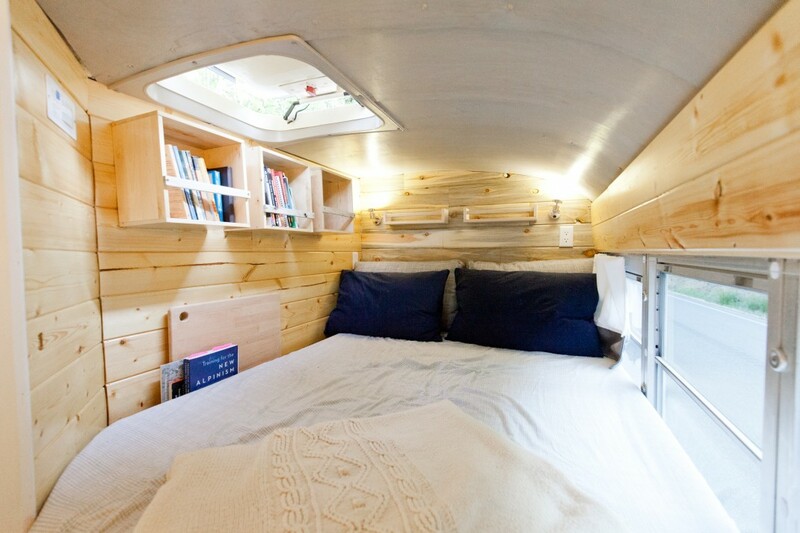 On the inside, it offers about 140-square-feet living space. 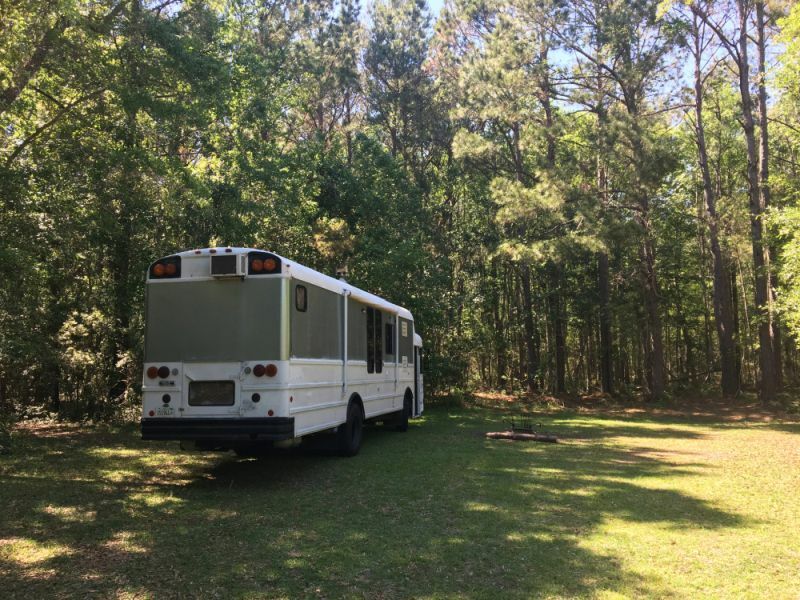 It can sleep six and has a full kitchen, complete bathroom, pantry, and closet. The wood-paneled ceiling and walls instantly capture attention, while widows bring in enough natural light. 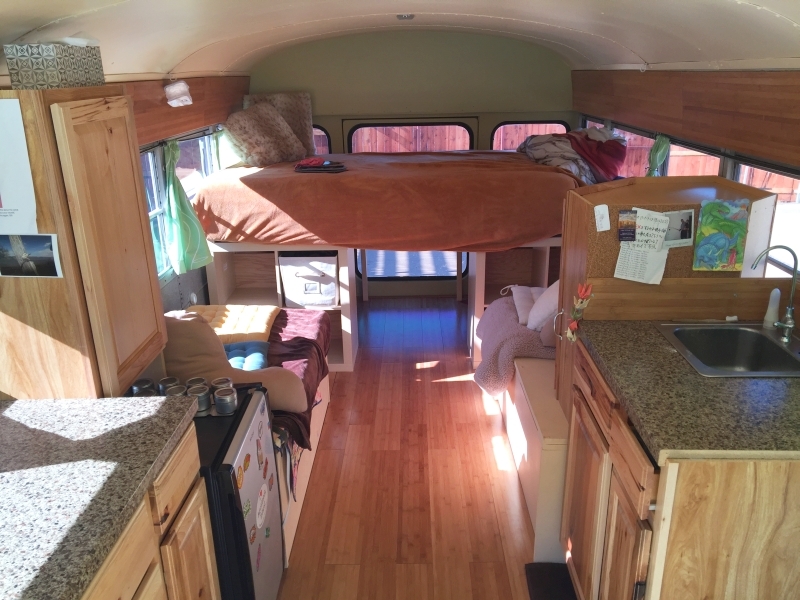 A family of five, wanting to live a simple life on the road, adopted the bus life in 2016. 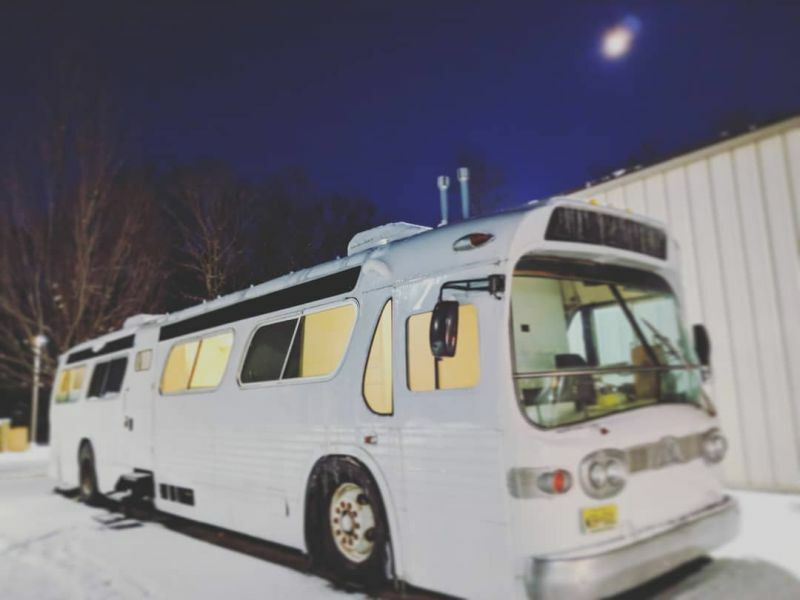 As main family members, Brandon and Ashley Trebitowski spent six months modifying a ‘99 Blue Bird school bus into a full-time home. 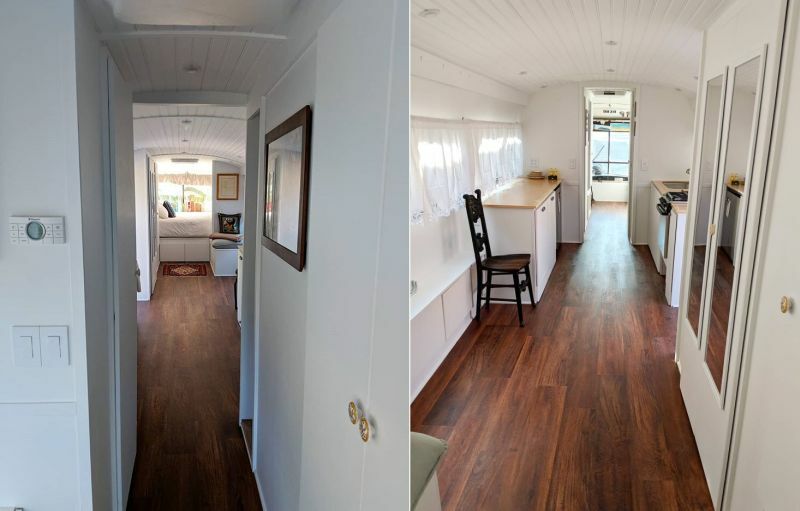 Within 240-square-feet of space, they managed to accommodate a living room with wood burner, kitchen, bunk beds for kids, and a master bedroom. 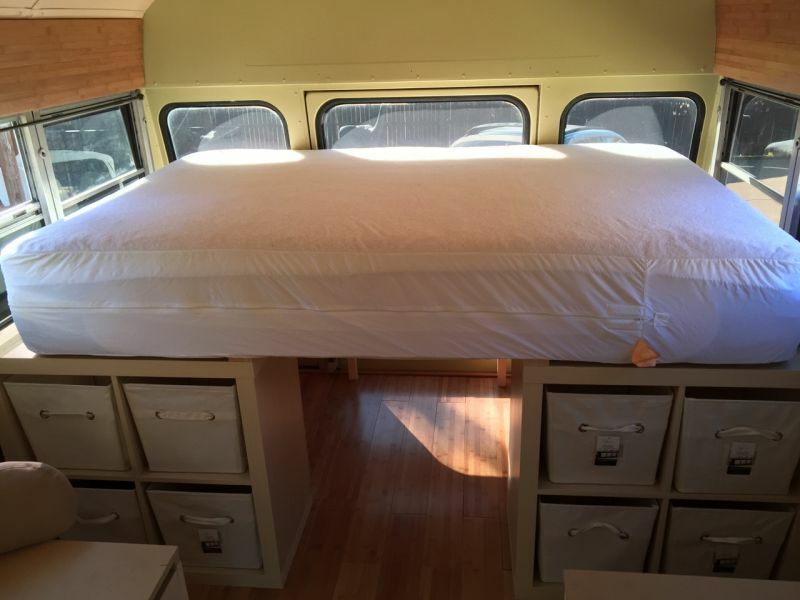 The master bedroom and storage are located at the back of the bus. 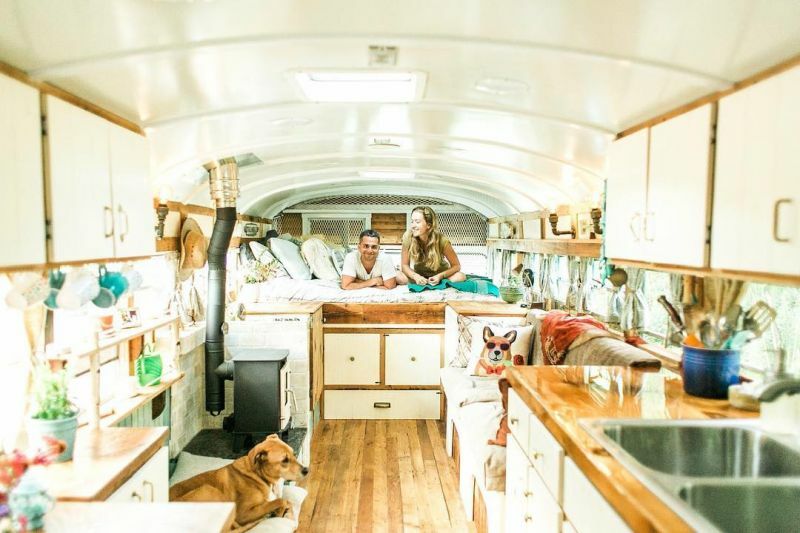 Another couple fascinated by the trend of bus conversions is Texas-based Christopher Stoll who along with his girlfriend Tori worked for about four months to convert an old church bus into a solar-powered tiny house on wheels for two. 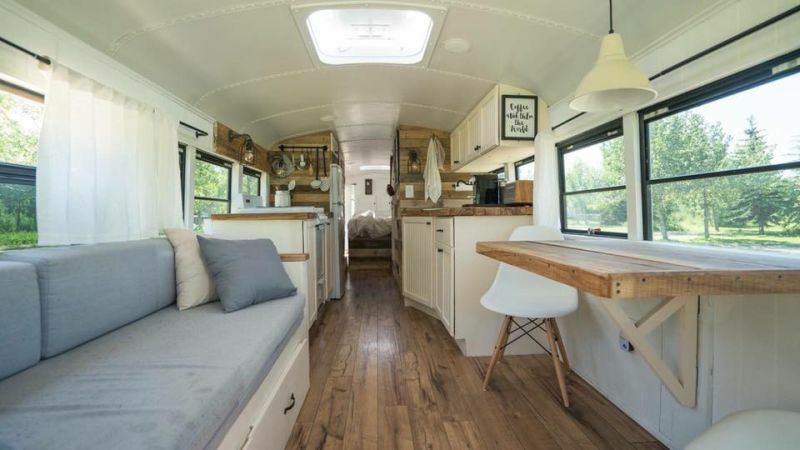 The couple bought it for $1,000 and spent about $10,000 on remodeling the entire bus into a home that doubles as their mobile studio. Interestingly, the biggest expense they had to bear during the build process was restoring the transmission which cost them around $3,500. 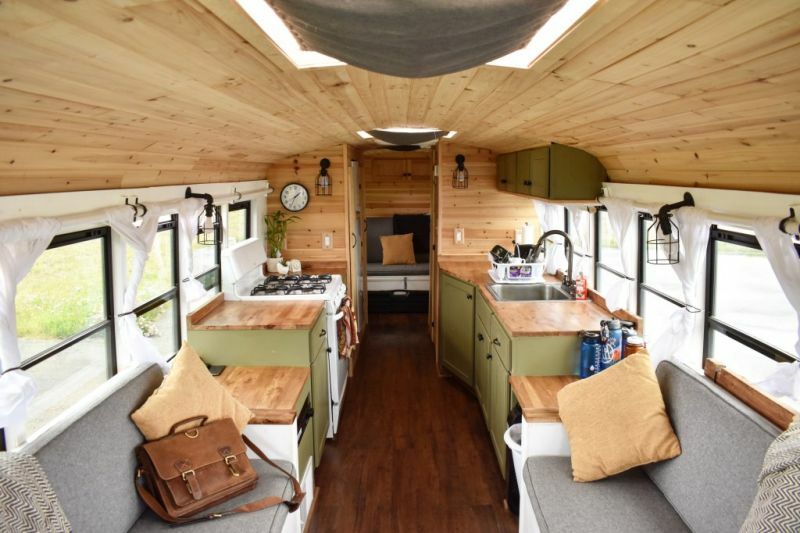 The final outcome is really worthwhile, as the couple now has a cozy home on wheels which has given wings to their imaginaton. 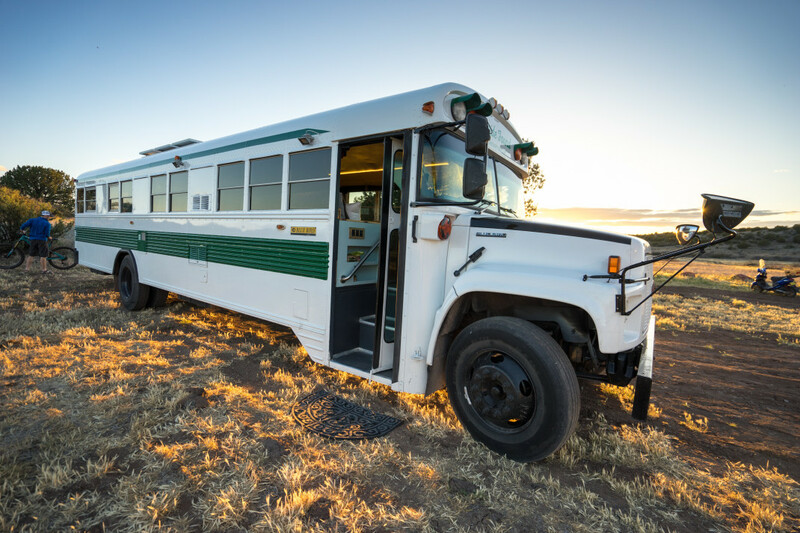 The Short Bus Retro is created by ME-based Winkelman Architecture for a client who wanted maximum flexibility to camp and calm down the wanderlust. 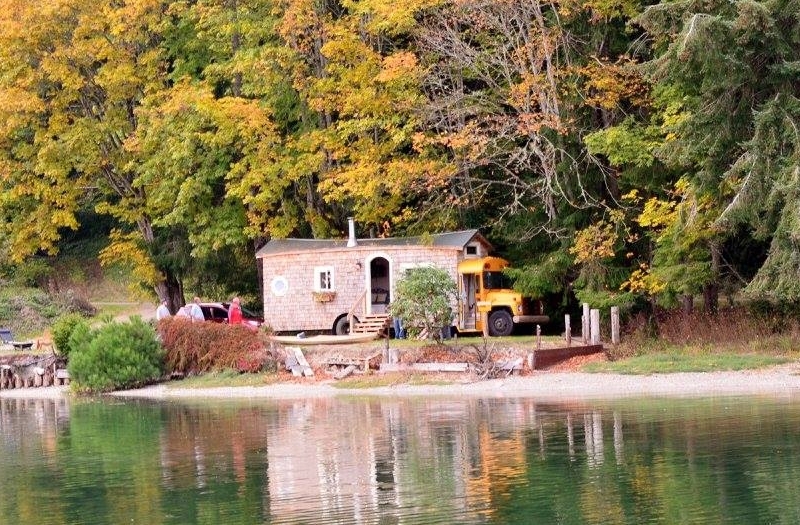 The idea was to make a house on wheels from a 1959 Chevrolet Viking short bus, which acted as a camper van for family escapades and group outings. With two sofas combined into a queen bed, it can accommodate two persons comfortably. 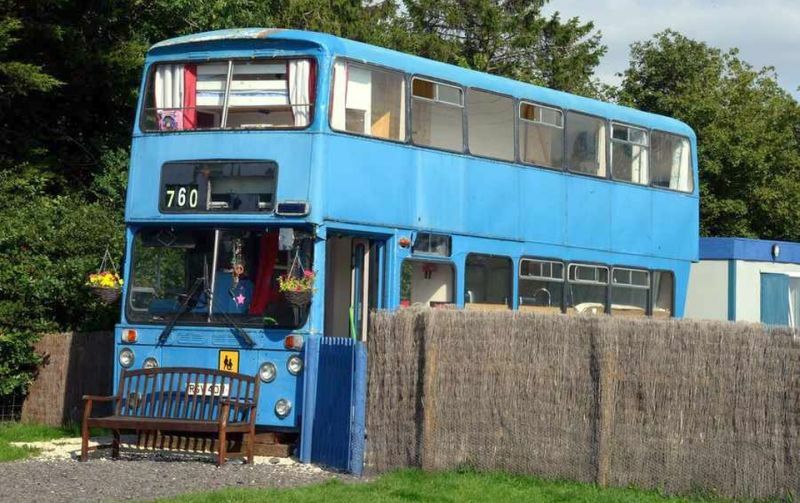 The final bus home comes complete with plumbing, power, and a funky living space. 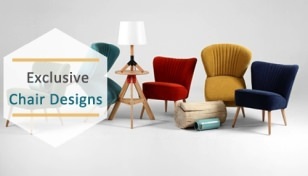 The interiors are given an extensive makeover with thoughtful design inputs, since managing the available space was one of the major concerns. 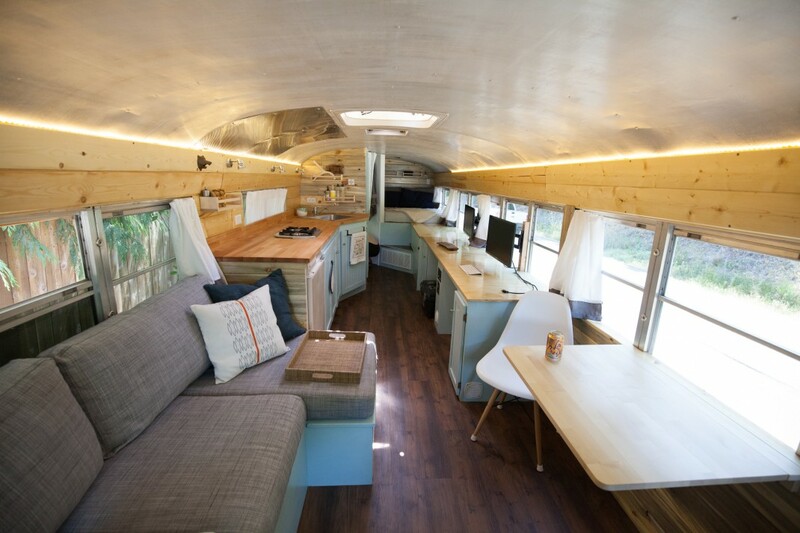 Have a look at this awe-inspiring bus conversion by Jeremy and Mira Thompson who revamped an old school bus, featured on HGTV’s Tiny House Nation. It took them almost four years to finally get what they dreamed of. The interior space is comfortable, while the pitched roof and shingled exteriors give it the appearance of a fairytale house. 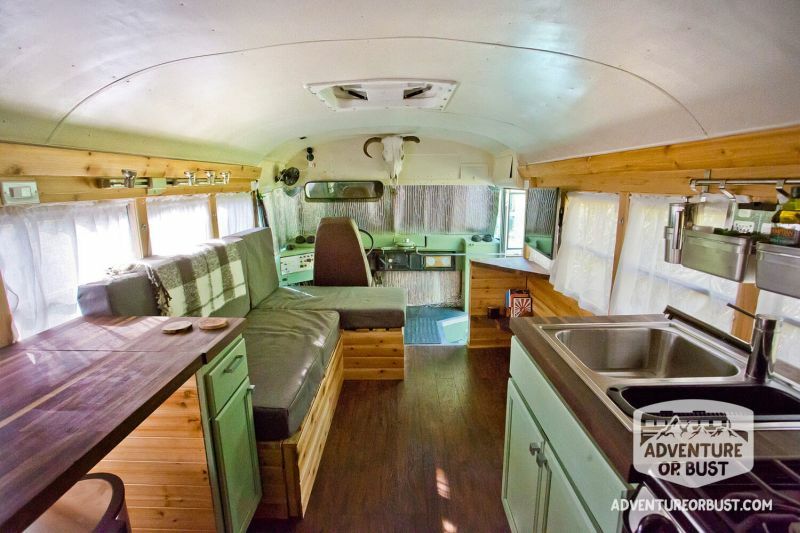 The loft bedroom that could be closed off for privacy and the fully functional flushing toilet are some of the highlighting features of this repurposed school bus home. It is situated on the picturesque lakeside view of Key Peninsula in Washington where they live with their two-year-old daughter, Carys. 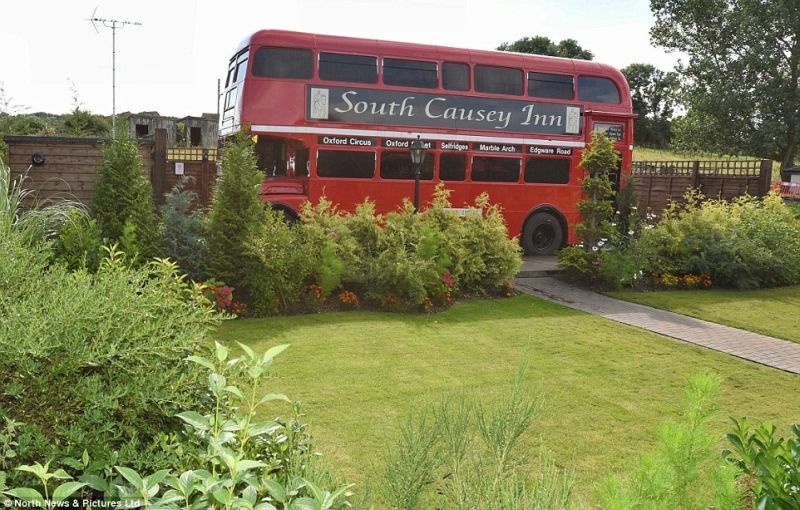 Trafalgar Square in South Causey Inn is a 1960 double-decker bus turned into a B&B hotel by County Durham-based couple Susan Mosier and Philip Mosier. 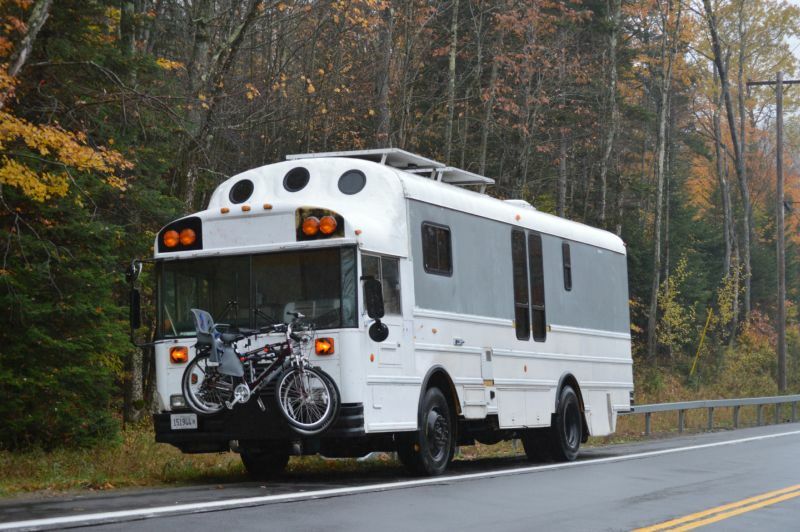 It is a good example of what bus conversions can actually result in. 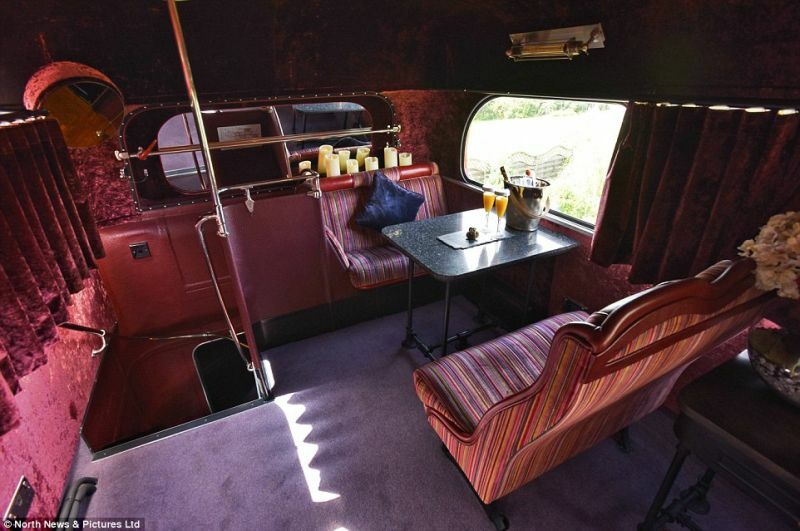 They bought the vintage bus for about £5000 (approx. $9,000) and spent nearly £100,000 (approx. $175,000) renovating it into a luxe home featuring a private garden and outdoor hot tub. The vintage bus is called Trafalgar Square and still has some of its original features like seats, steering wheel, and signs. 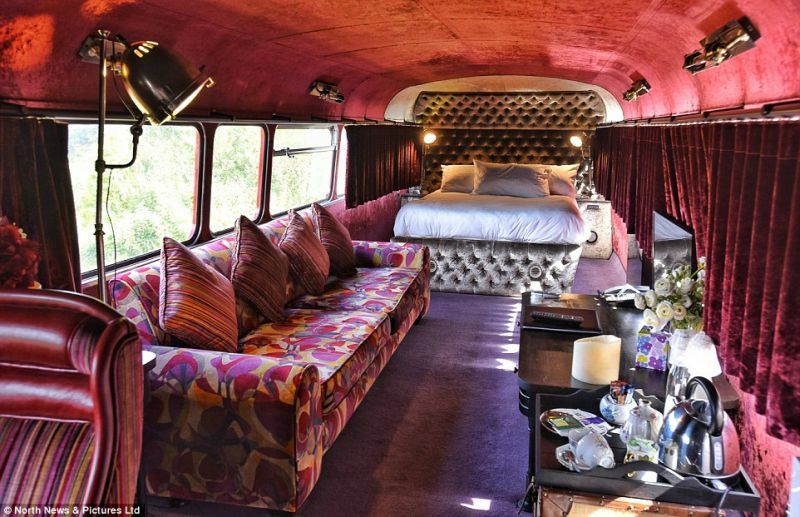 Although, it’s exterior looks like any other ordinary bus, the living space is a reddish haven. 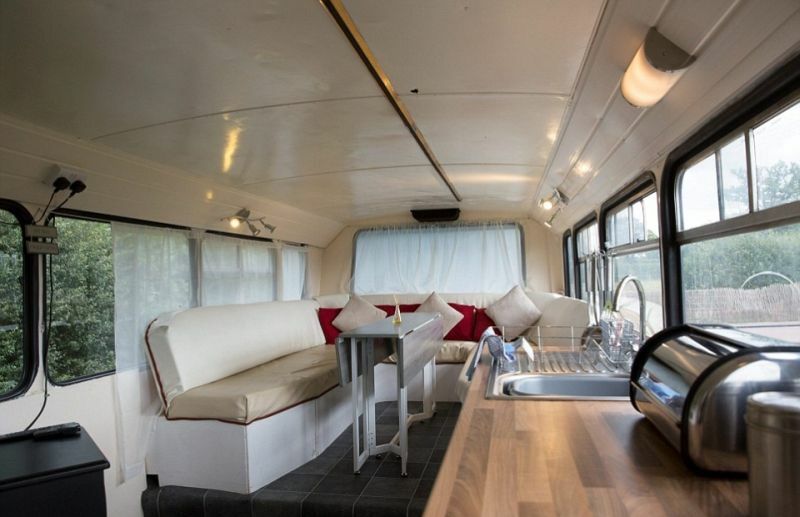 Travel enthusiasts Andrew and Lisa-Jayne Powis wanted to travel the countryside in a mobile home just like the renowned British pop singer Cliff Richard; so they turned an old Leyland Atlantean double-decker bus into a luxurious tiny house on wheels working six weeks and spending about £15,000 (approx. $23,000). 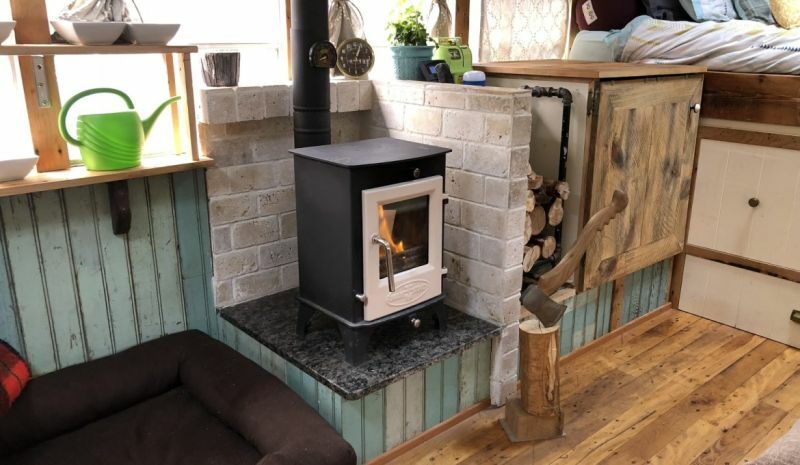 There is a fully-equipped kitchen on the first floor, three heated bedrooms on the top, along with an indoor garden, outdoor hot tub, and bathroom with shower and toilet. 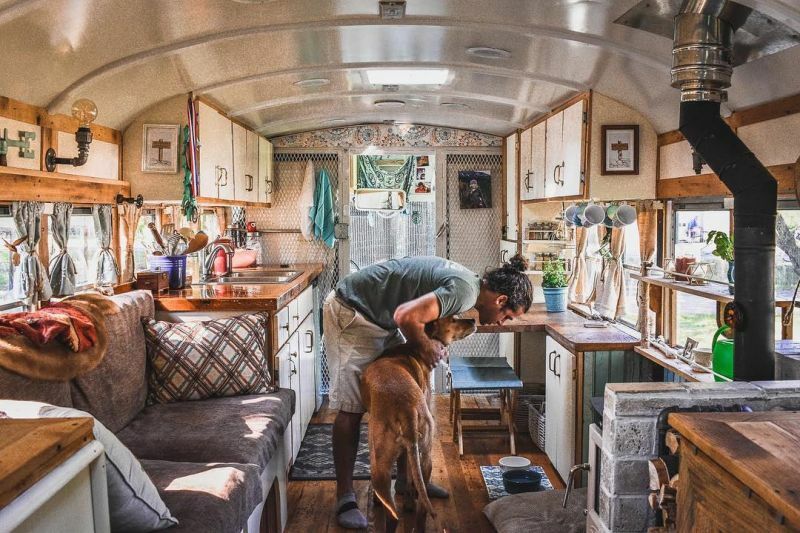 The motivation behind renovating the old bus into a livable home was multiple rejections for a home because of their two big dogs. 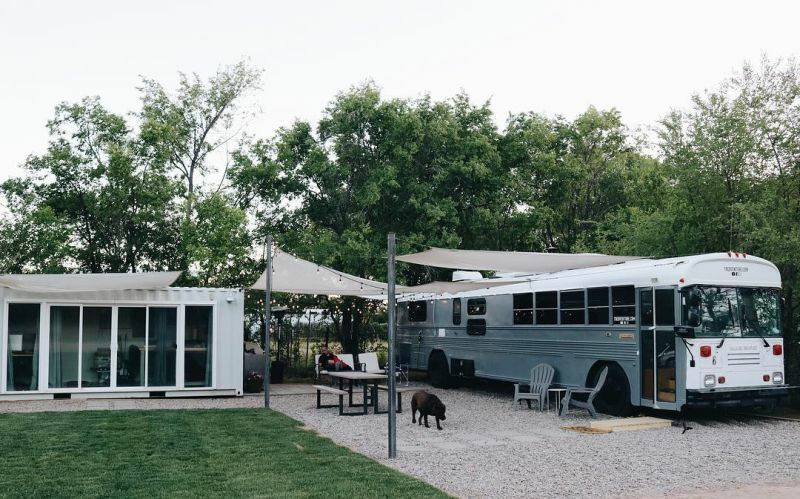 This double-decker bus converted into a mobile home by Daniel Bond and his girlfriend Stacey Drinkwater gives them a way to have a debt-free house. 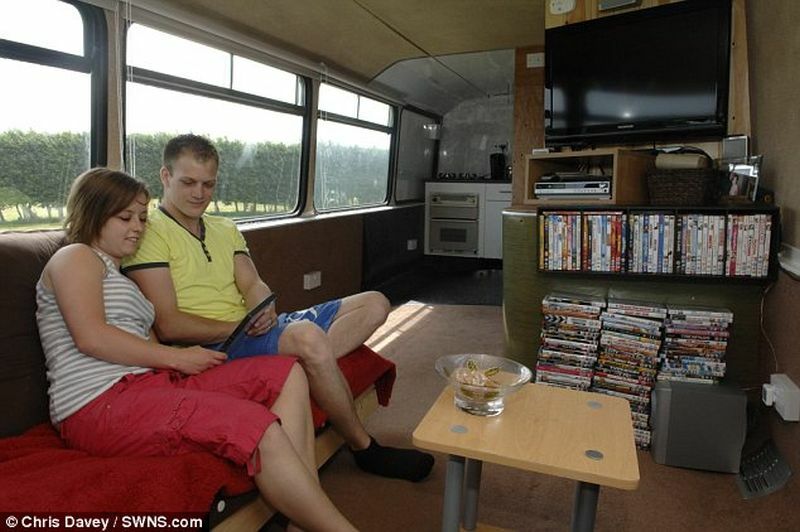 They bought the bus for £3,000 and spent about £11,000 on plumbing, kitchen and bedrooms. 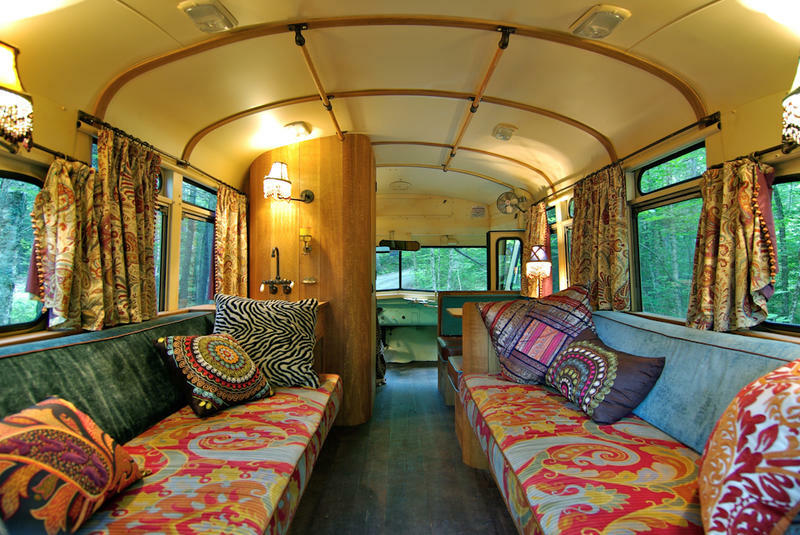 It took about four months of work to transform a bus into a comfy mobile home. 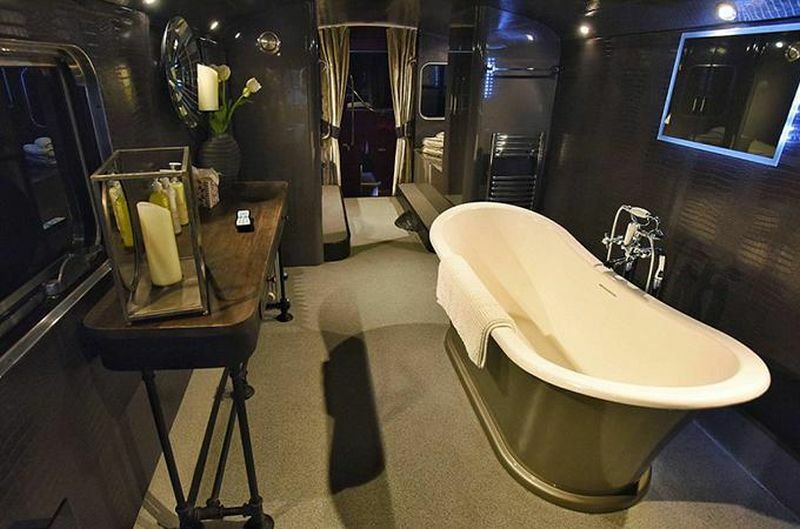 They have comfortably packed a lounge, kitchen, two bedrooms, bathroom and a toilet into this tiny home.